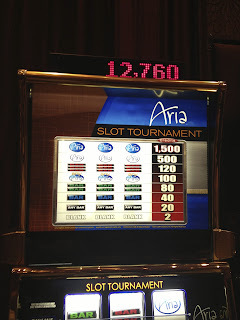 LAS VEGAS DAZE: Aria 300k Winner Take All Slot Tournament! 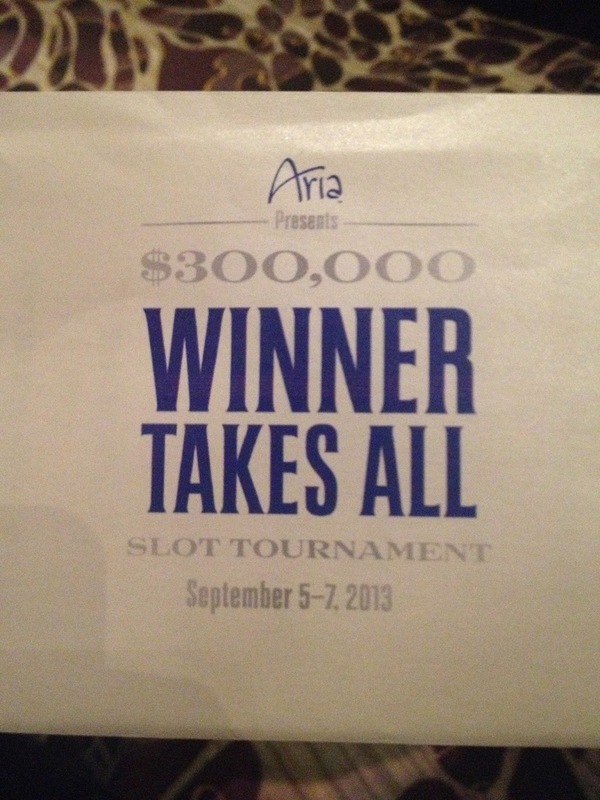 Aria 300k Winner Take All Slot Tournament! 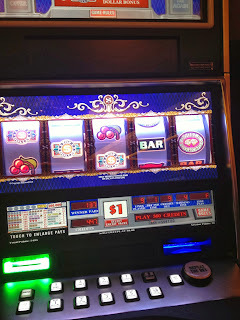 I wasn't going to Las Vegas in early September until a post in Slot Fanatics reminded me about a slot tournament invitation from Aria that I had forgotten. It was a buy in tournament for 1k and since I miss the free ones that M-Life used to have, I usually ignore the buy in tourney's these days. 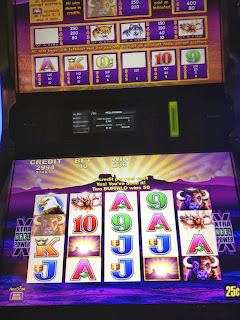 The post was asking if the tournament was a good deal because it was a winner take all tournament with first place getting a prize of 150k and everyone else in tournament getting their 1k buy in back in free play at the end of the tournament. 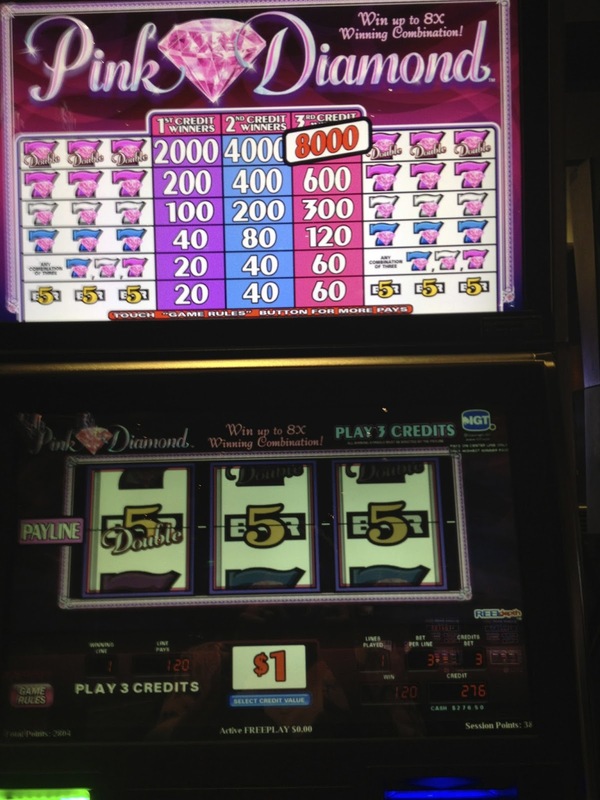 With the tournament limited to only 150 participants (or so I thought, more on this later), it seemed like a great deal to have a 150 to 1 shot at 150k jackpot so Randy and I entered! 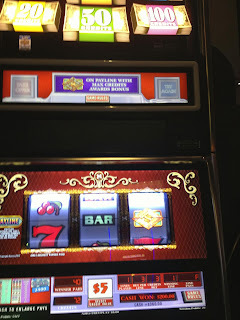 We left on Thursday, September 5th and had a smooth flight to Las Vegas from San Jose. Since we're still NOIR with M-Life until October 1st when we revert to Platinum status (it was fun while it lasted, hate the new M-Life rules) we had the complimentary limo to and from the airport. 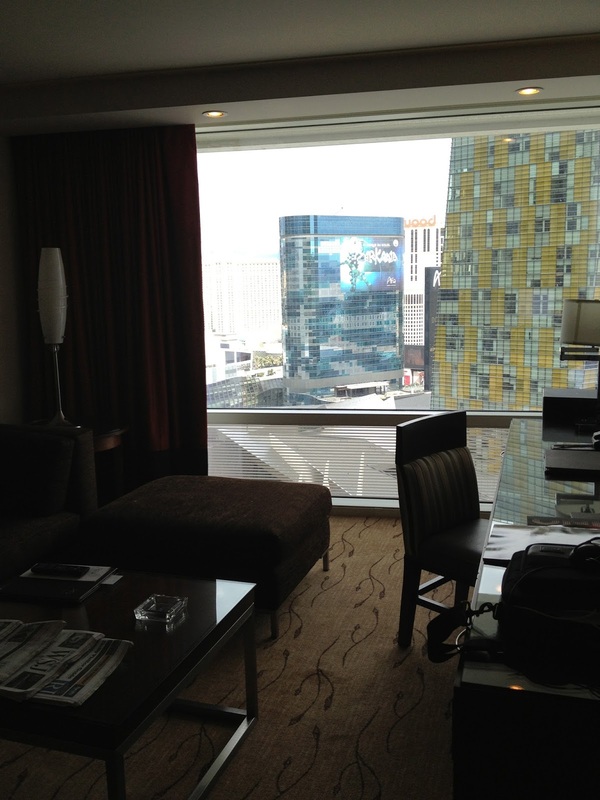 Our Aria host had provided VIP check in via the Aria Sky Suites Desk. 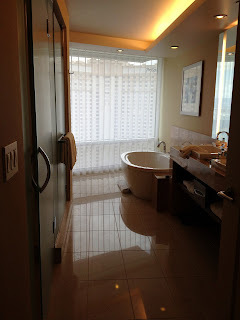 Service was excellent at the Sky Suite VIP check in, though we did have a problem starting out. 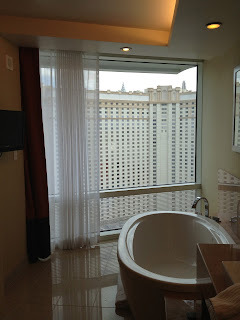 We weren't in a Sky Suite but a panoramic corner suite. I requested a corner suite far away from Cosmopolitan and Aria nightclub noise. 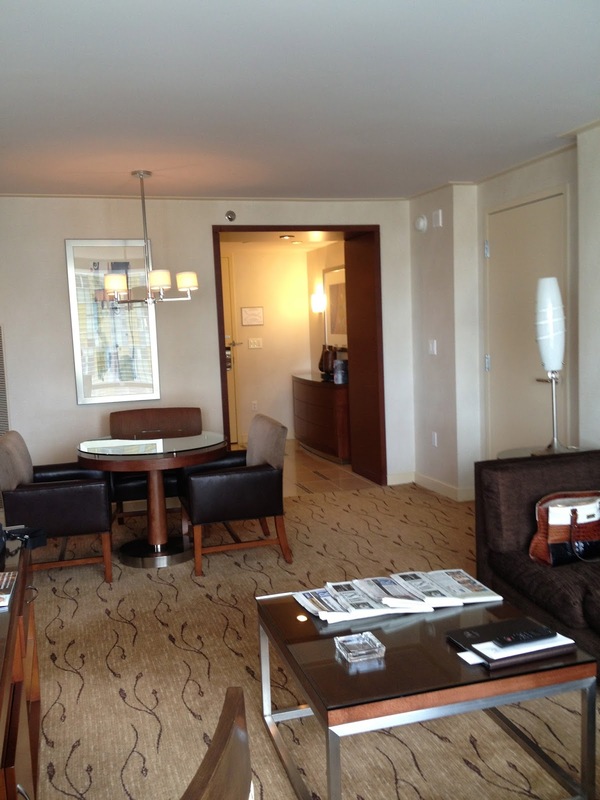 I must have originally had a new person helping me at the VIP desk because she gave us a suite on the 19th floor that she said wouldn't get any noise. Hmmmm. Above is photo of floral arrangement at Sky Suite check in. 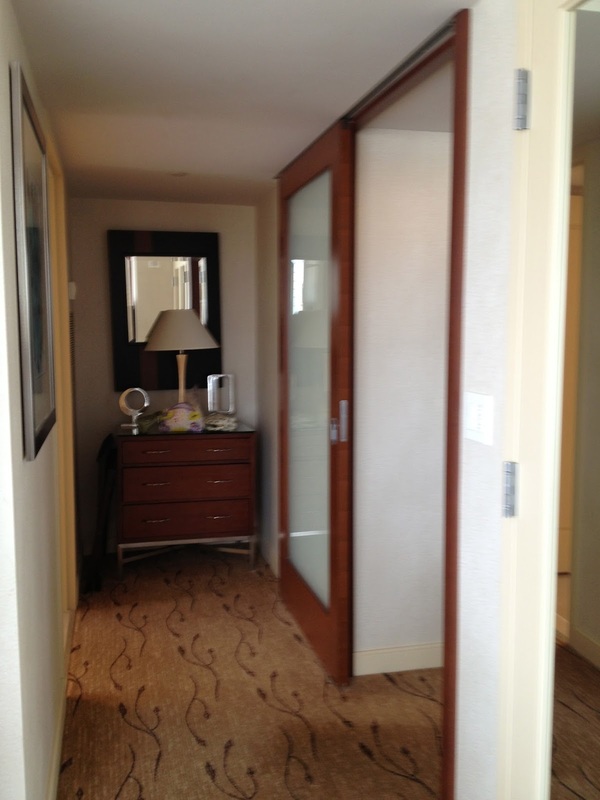 We get to our suite on the 19th floor and not only isn't it the panoramic corner suite, instead it's the corner suite with the large pillar in the middle of the living room. 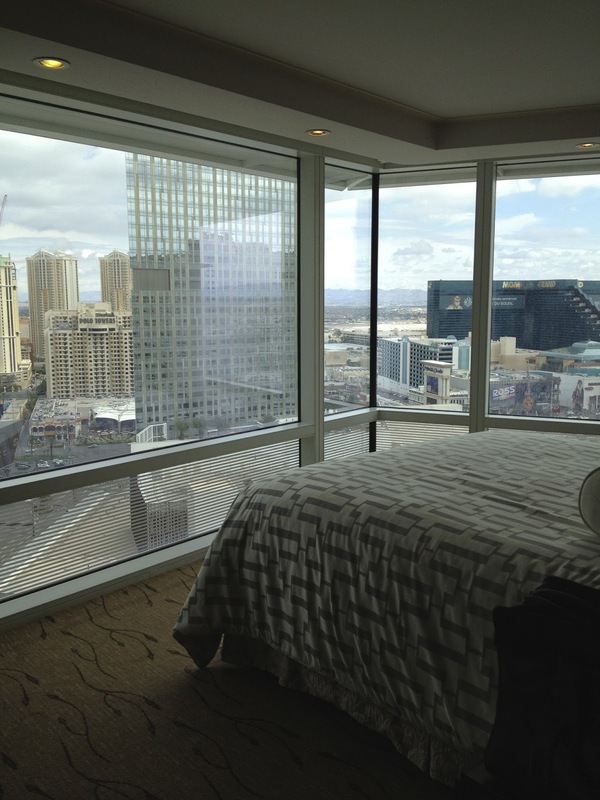 The worse is that the bedroom overlooks the Cosmopolitan pools where they have the day time parties with loud music playing and the living room is almost on top of Cosmopolitan's Marquee nightclub! 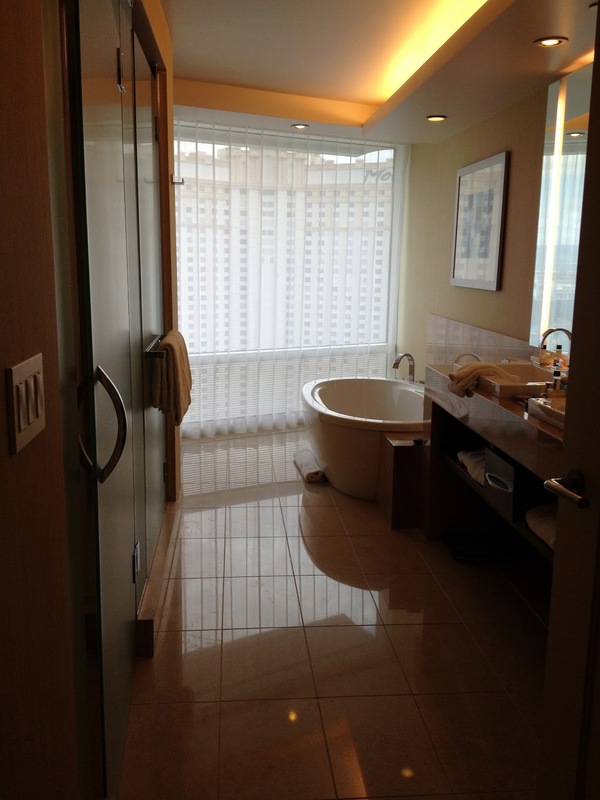 No way am I'm staying in this suite! I immediately call down to VIP check in and tell them the problem and while I'm on hold waiting for them to locate a new room our bellman arrives with the luggage. I tell our bellman I'm on hold to change rooms because I'm concerned about noise from Cosmo and he takes a look around and cracks up agreeing with me that we would never get any sleep in that room either at night or during the day. We finally get located to a actual panoramic corner suite with city view and close to Monte Carlo on the 23rd floor but had to accept a smoking suite. 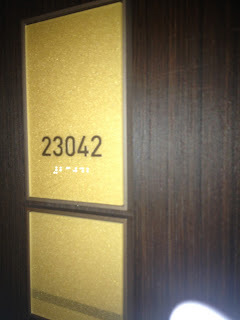 John our bell man was great, stayed with us for the 10 minutes I was on the phone trying to change rooms and then escorted us to the new room where he checked it out and found one of our air conditioning controls was not working and reported it to maintenance for us. John received a various generous tip for his patience and customer service skills. 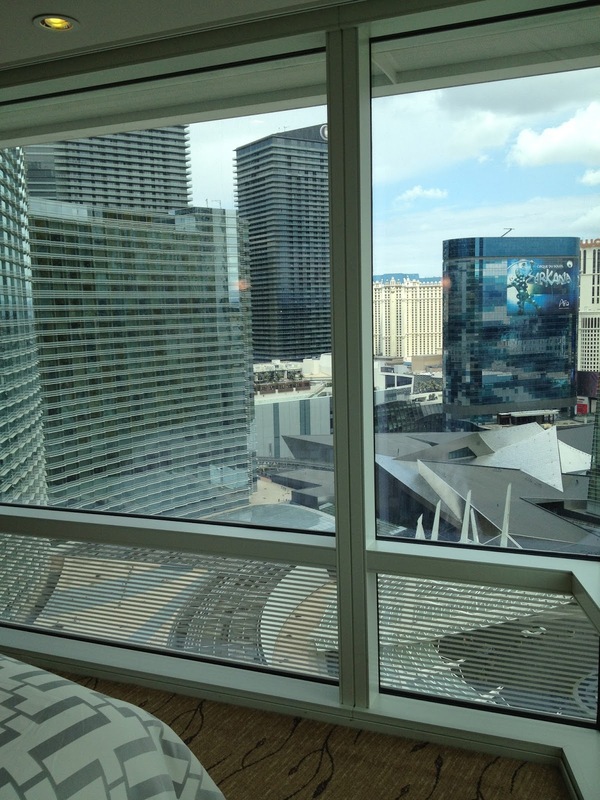 This is the 5th time I have stayed in a panoramic corner suite at Aria and I love them. 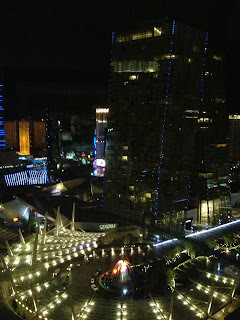 I always request the city view because at night I love the neon, lights and Aria's colorful entrance fountain. In the corner suites the safe is in the closet, unlike their regular rooms where it's hidden in a side table drawer. Here's a lot of photos of the suite in case you haven't seen it before. 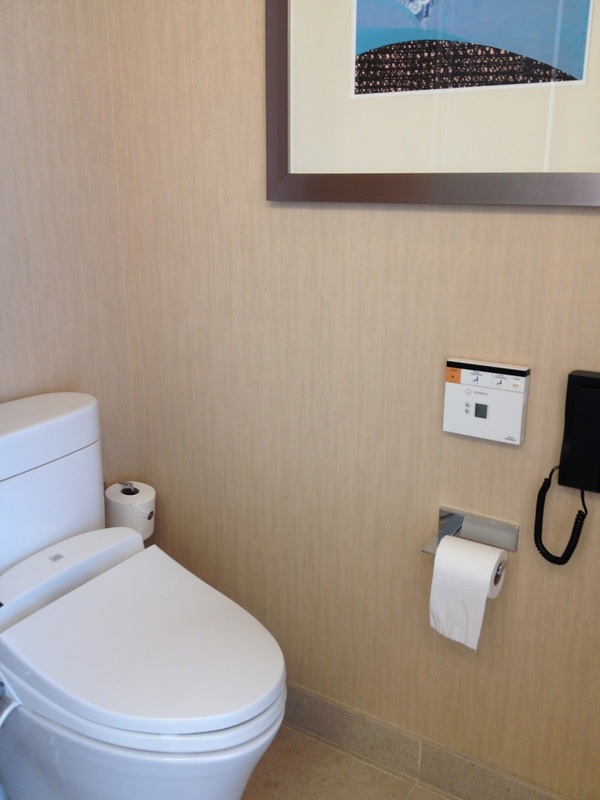 Commodes in the Aria suites have the control panels that do almost everything for you. 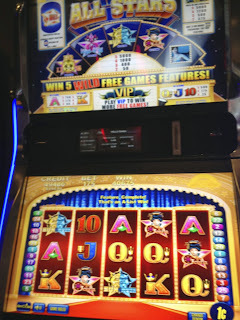 To enlarge photos to see details click on them. In addition to the fridge that has the mini bar items you have a second empty fridge to use. Haven't seen enough of the room, want a guided tour? Here's a video of it I took. 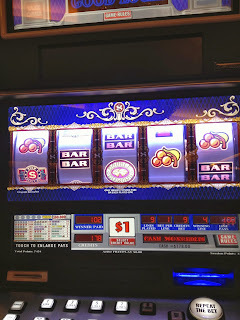 Sorry it's with my cell, as my regular camera's battery had run out and I couldn't locate the recharger until we were packing up to leave, LOL! After unpacking it was almost time to register for the tournament so we went down to the casino and started to play. We went to Spin the high limit slot room at Aria and had a bit of luck on $1 Top Dollar there which is $9 minimum spin. 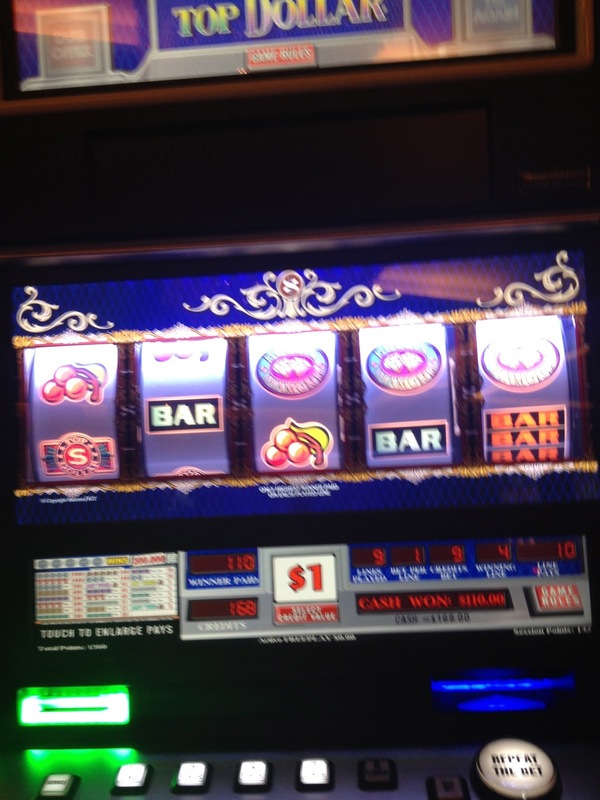 Unfortunately our luck didn't last long so we left while still a few dollars ahead. 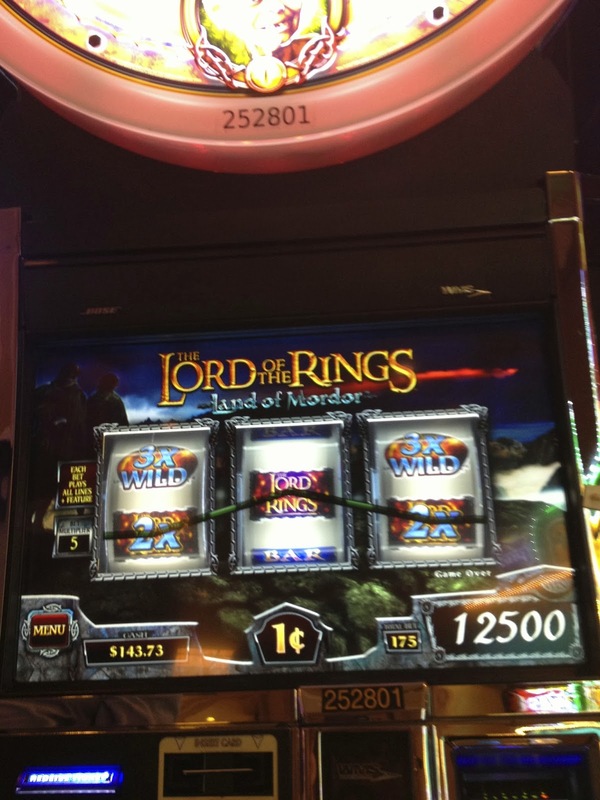 Randy wanted to play Lord of the Rings and we had one decent hit on it, but no bonuses. 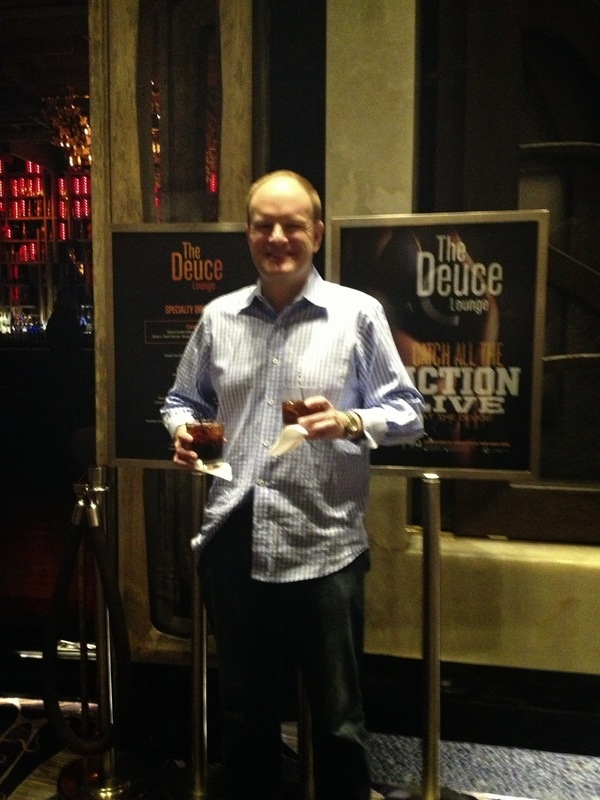 It was then time to go register for tournament outside of the Deuce Lounge. There was a line when we arrived but it went quickly. 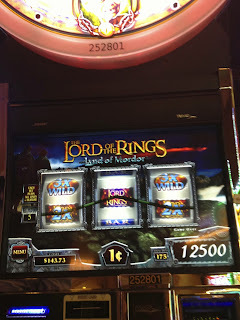 Once registered I spun to select my lucky machines for the tournament. 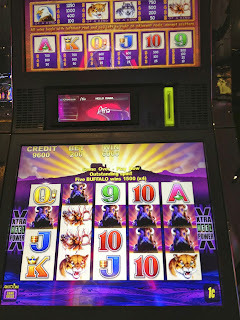 I ended up spinning twice because I didn't like the first numbers. 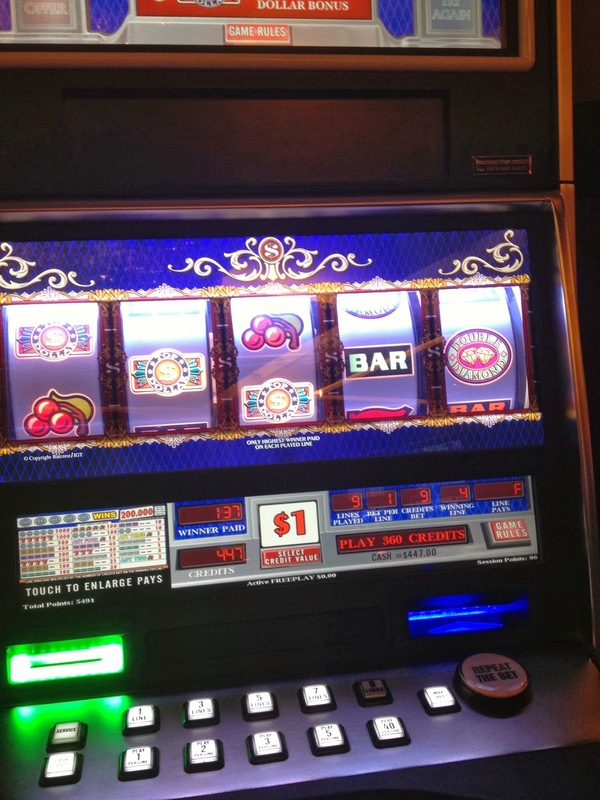 I ended up taking machines, 1, 43, and 5. 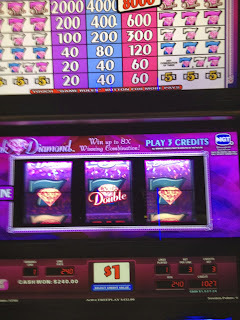 I should have spun a 3rd time, LOL! 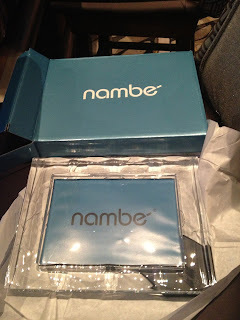 They handed everyone a bag that contained a welcome gift. 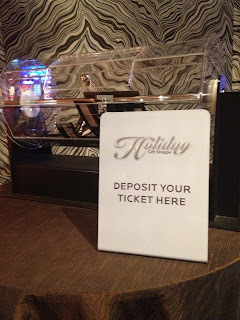 Everyone in the tournament received a ticket for a drawing at the end of the tournament for holiday gift points. The welcome gift was a very heavy glass frame by Nambe. 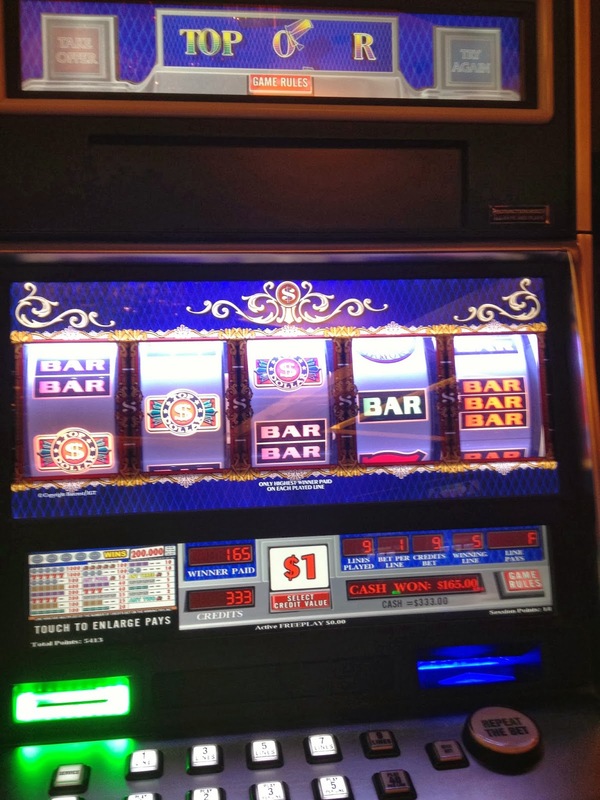 After returning to our room to put away our heavy gift and slot tournament materials we had about 30 minutes before dinner to play slots. 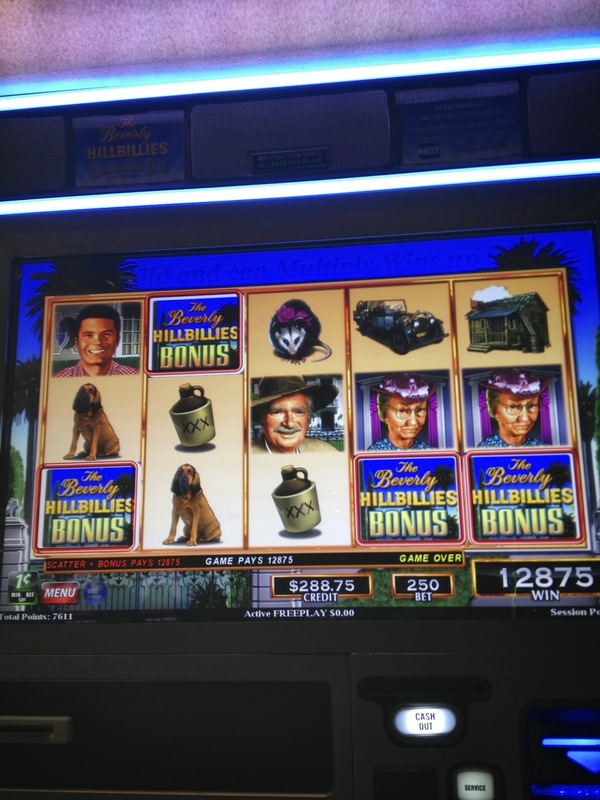 Beverly Hillbillies, one of my favorites didn't want to give me much but I had a fun bonus on Airplane. 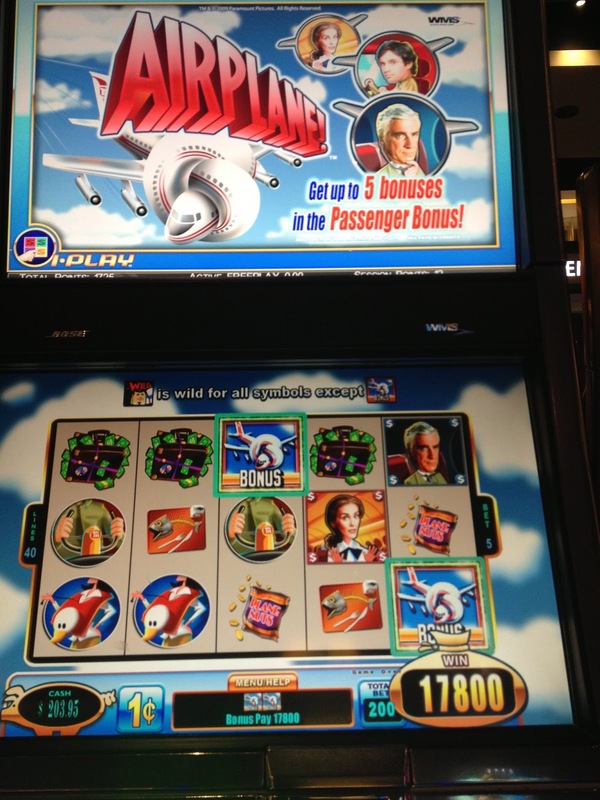 Below is a video of the above Airplane bonus! 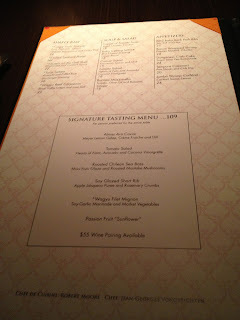 Dinner tonight was at Jean Georges at Aria. Bread basket had a great assortment of breads including my favorite pretzel bread. 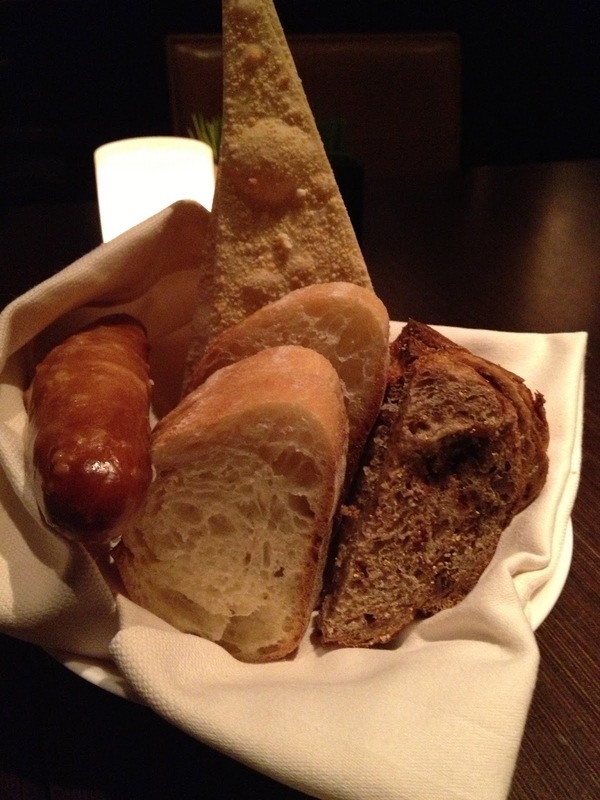 Excellent bread though the pretzel bread didn't quite measure up to Cut's! 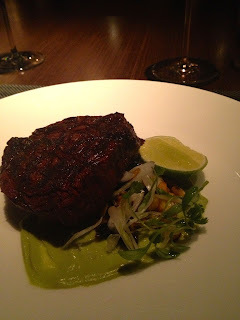 Randy ordered off the menu while I had the Signature Tasting Menu above. We started out with 2 tasty cocktails but I ended up giving most of mine to Randy as I also ordered the wine pairing with my tasting. 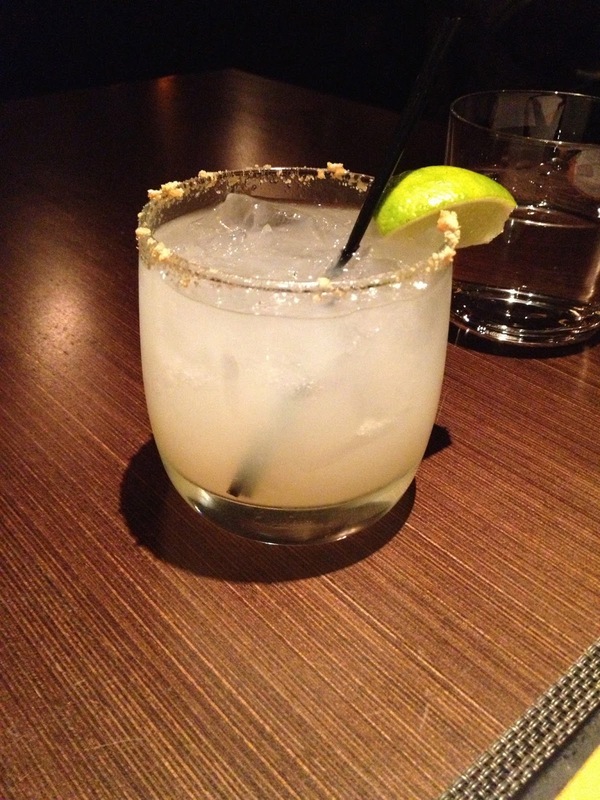 Above is a delicious ginger margarita! Below was a good lemoncello type martini. 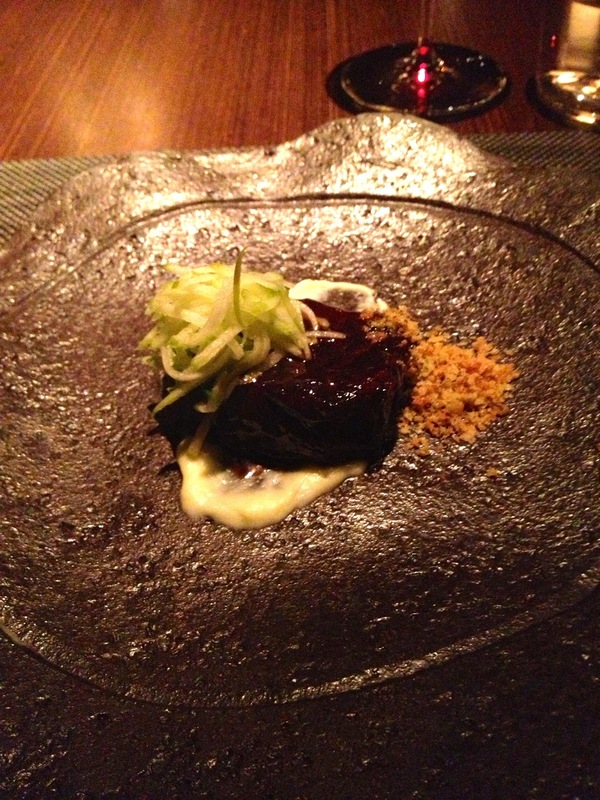 I told them to skip the amuse since I don't care for Caviar. 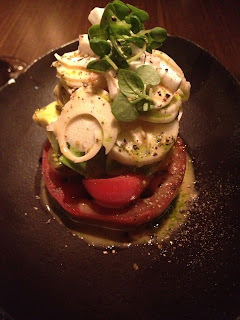 They didn't offer a substitution but instead brought the tomato salad with hearts of palm, avocado and a coconut vinaigrette out. 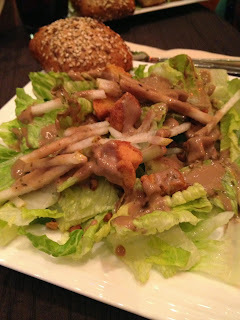 I liked it a lot and it paired well with the wine which was a Riesling. 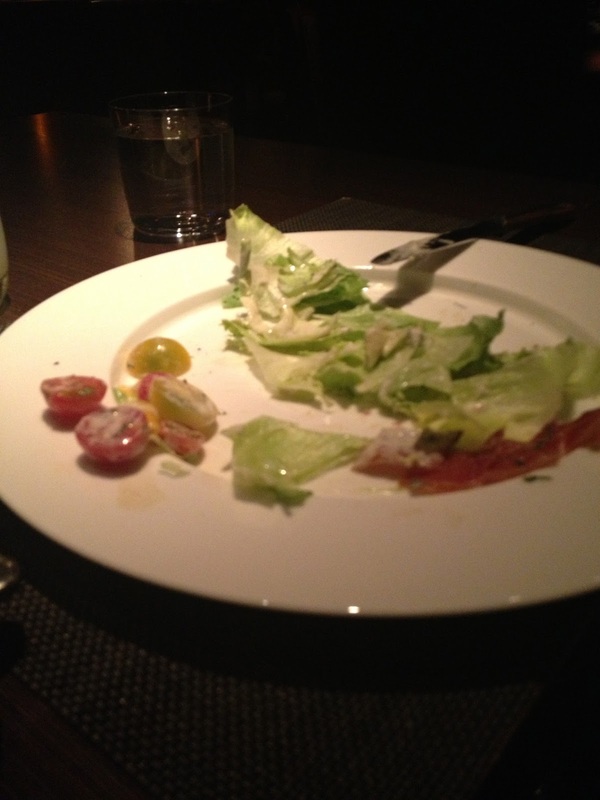 Randy ordered a salad too, but I forgot to take the photo until after he had almost finished eating it. As you can tell he enjoyed it. Randy's salad was baby iceberg lettuce with crispy bacon and heirloom tomatoes with a blue cheese dressing. 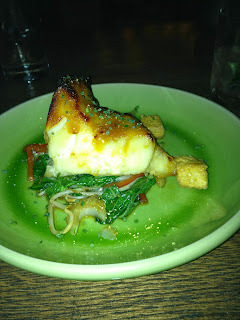 My next course was one of my favorites, roasted Chilean Sea Bass with miso yuzu glaze and maiitake mushrooms. 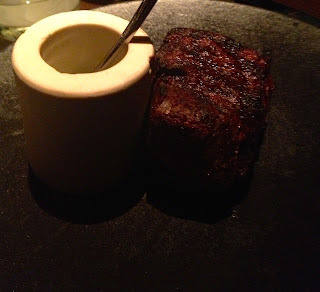 I've had this before here where it hasn't been the tasting portion and it was wonderful as always. 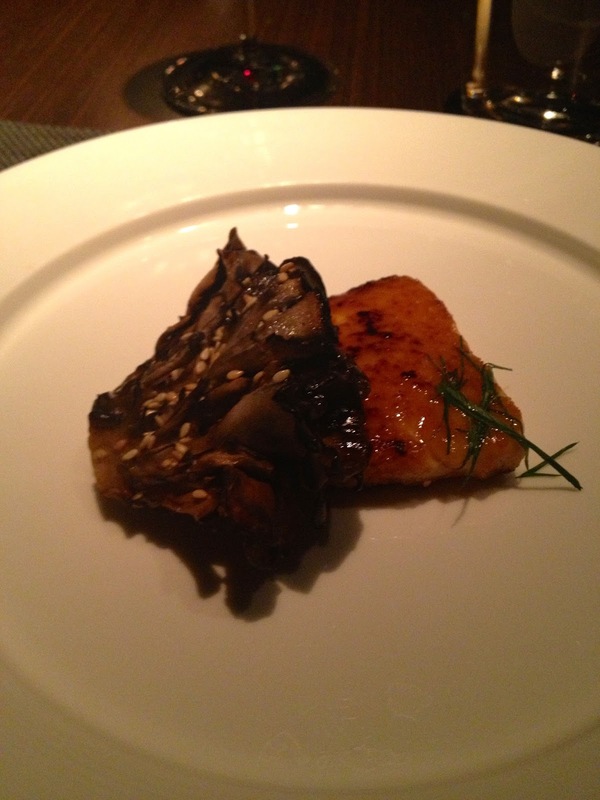 However both Randy and I give a slight edge to the miso glazed sea bass at Tao. I was so glad that my next course the soy glazed short rib with apple jalapeño puree and rosemary crumbs was a tasting portion as it was fantastic, but so rich! Truly a outstanding dish, and the rosemary crumbs added a delightful crunch. It's so rich that I'm not sure I could eat a regular serving of it. 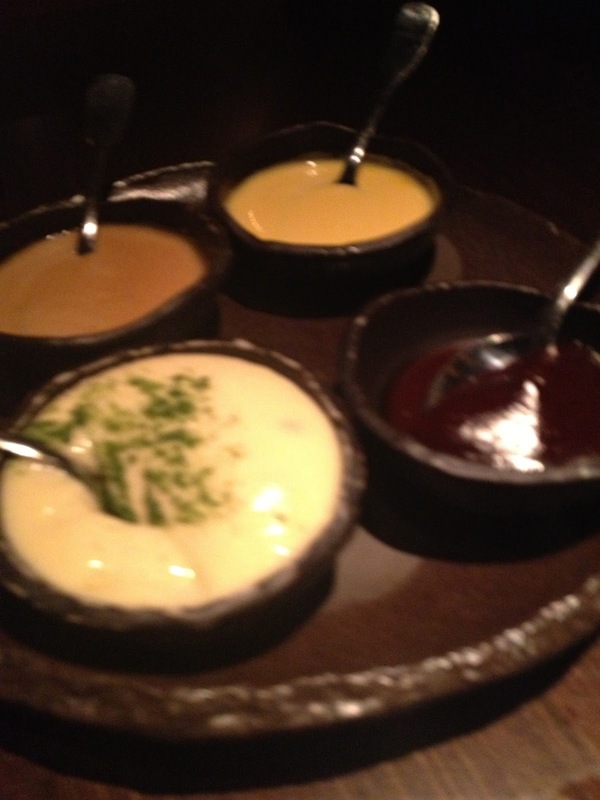 Below are the complimentary steak sauces. There's a house made steak sauce, soy miso butter, Béarnaise and a house made hot sauce. All of them were good but my favorite was the hot sauce. Below is Randy's 8 ounce Filet Mignon which was cooked perfectly. 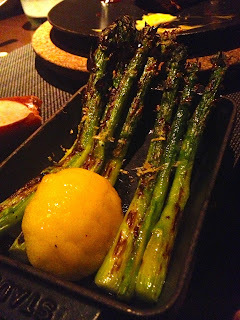 Randy had a side of grilled asparagus with his filet. 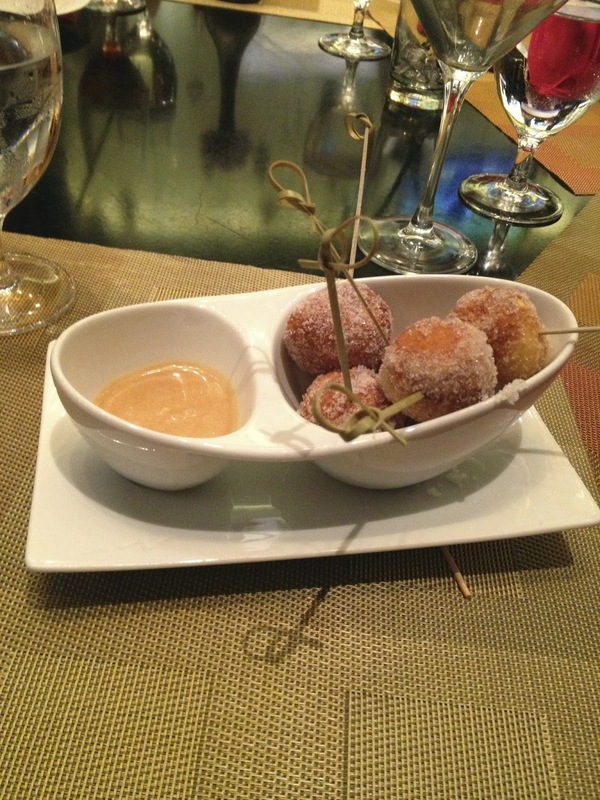 Dessert for Randy was Churros with dipping sauces of chocolate, raspberry and Dulce de Leche. 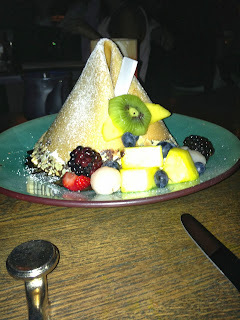 My dessert which was again a regular size portion and not a tasting, was a passion fruit "Sun Flower". While Randy liked his Churros we both thought the passion fruit was the winner between the two. 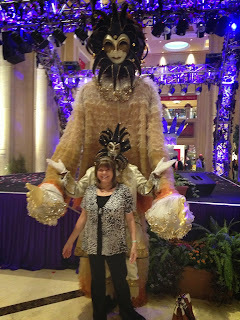 After our fabulous dinner it was time to waddle off to Bally's to see the show Veronic Voices. Thanks to a post in the Las Vegas Trip Advisor forum by mdm4sfest I was able to get free tickets to this show and only pay the service charge of $2.50 each for them. 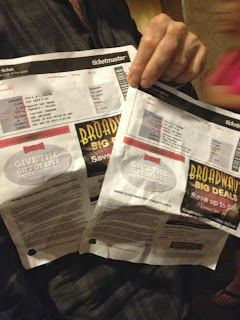 The code was Vpaper and still might work at various times for free tickets, at least it's worth a try. Veronic's show is great, I'm not sure why they are offering free tickets for it, because it's worth paying full price to see this talented lady. 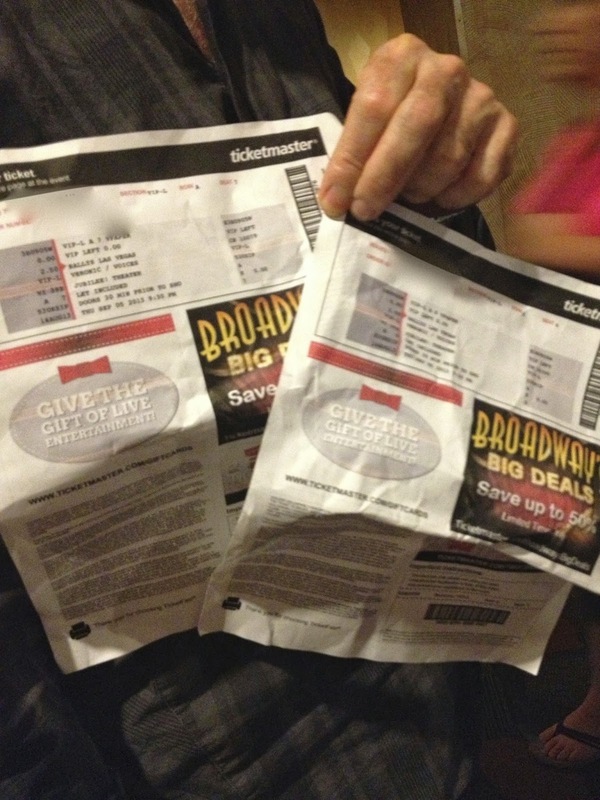 If you can get discounted or free tickets. jump on the offer, you won't be disappointed! 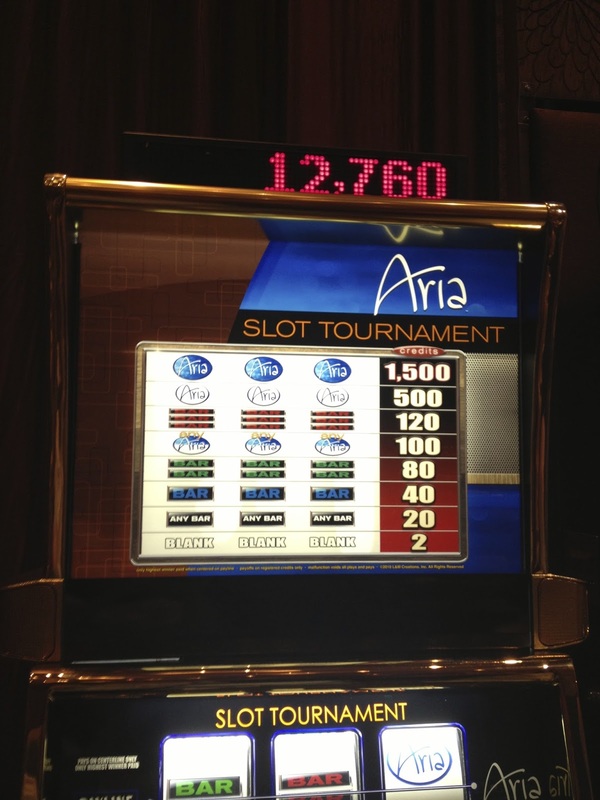 After the show we returned to Aria and gambled a bit more. 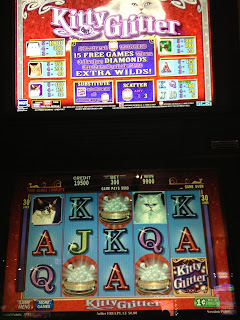 We finally hit a bonus on Kitty Glitter after I told my husband we would never get one, but it didn't pay all that much. 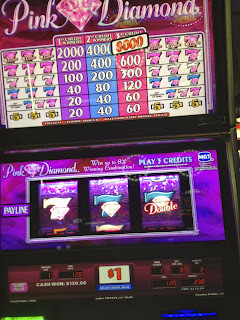 I love the Pink Diamond slots and the ones at Aria are usually lucky for me. 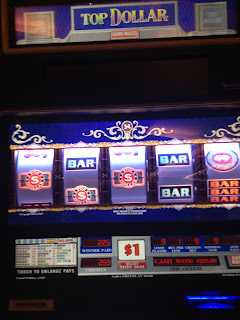 This trip I had some luck on them at various times. It was late so we went back to enjoy our suite and found our host had gifted us with chocolate covered strawberries. 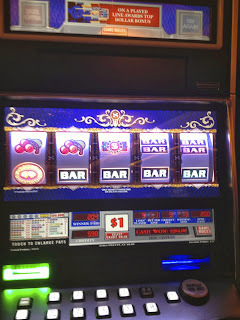 Made sure you always request turn down service at Aria as they have the most delicious assorted flavored chocolates they leave bedside for you along with a nightly quote. 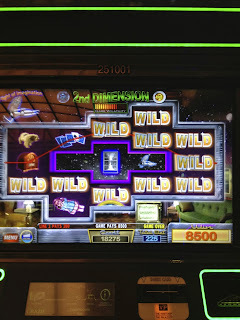 We slept in until 10:30am when it was time to get ready for our first session at the Winner Take All Slot tournament at noon. 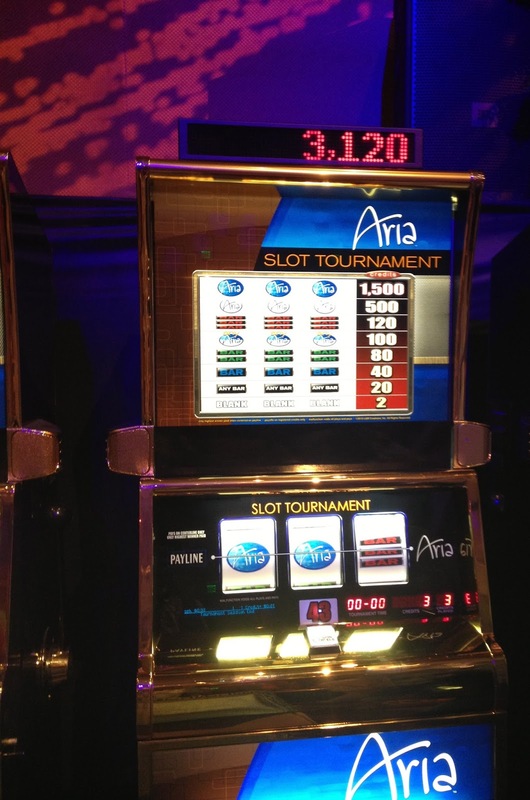 The slot tournaments at Aria are always held in a private ballroom, this time it was the Pinyon Ballroom. 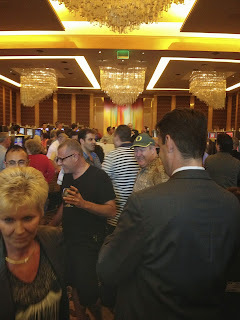 There is food and open bars at each slot session. 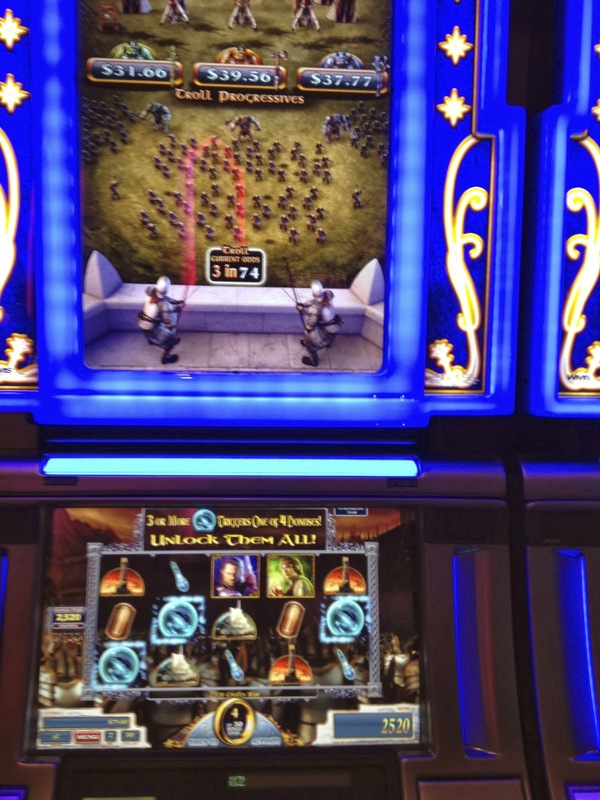 They do a great job of trying to make the slot tournament into a party atmosphere. 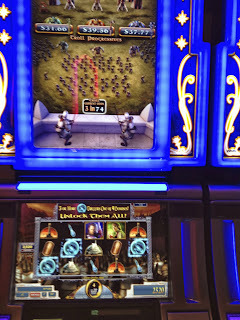 While I've been in slot tournaments before with a friend or even two, this slot tournament there was six of us entered who knew each other from real life or online message boards! 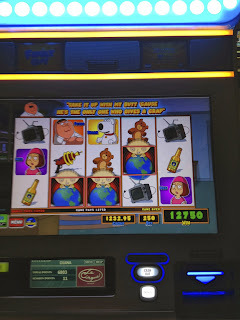 My husband took this photo of us, we're only missing Top Dollar from Slot Fanatics who had wandered off, likely intentionally, LOL! From left to right, Brian, Kimsa, myself, Brensan and her friend, and luvstp. I had a good, not great first session on machine one at my noon session. 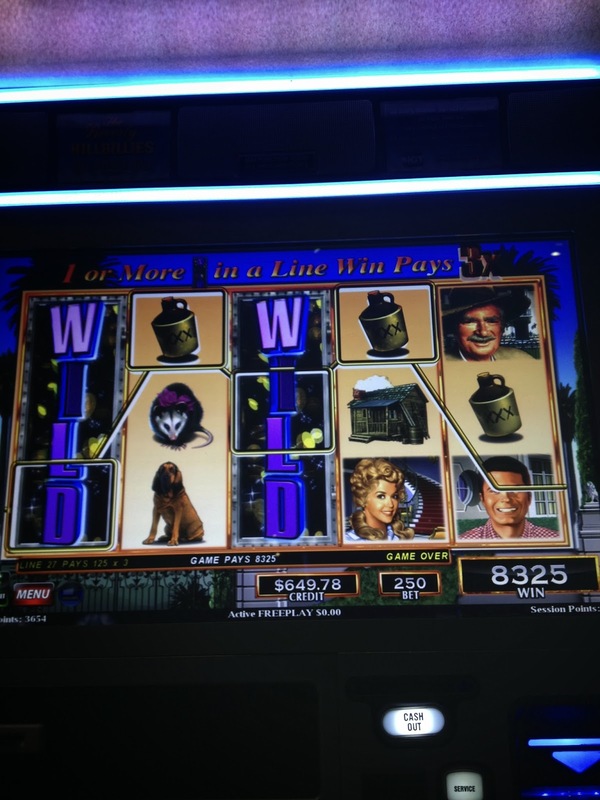 My second session on machine 43 at 12:25 pretty much killed any dreams of winning this tournament. 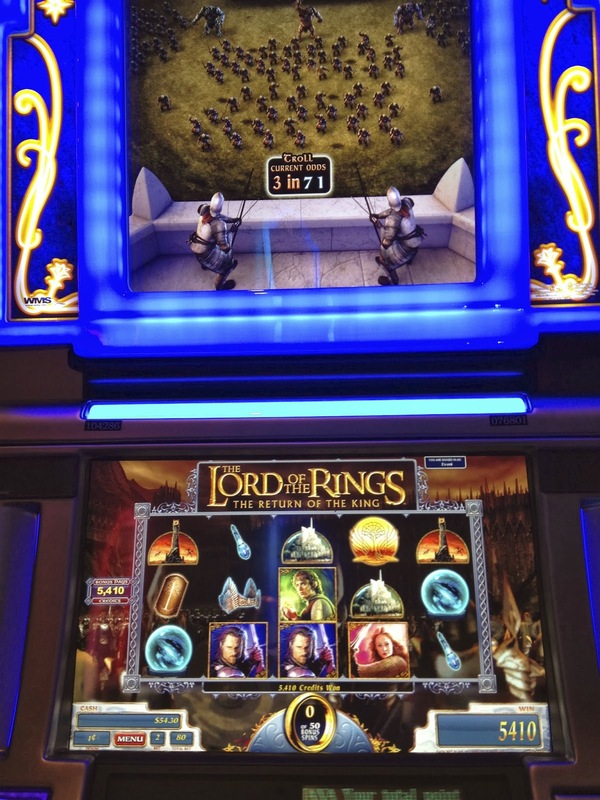 Kimsa playing on machine one during her first or second slot session had a fantastic score and it put her in the running to possibly win the tournament depending on what her 3rd session might be the next day of the tournament! Randy and I had fun chatting with everyone at the tournament. It's a lot more fun when you know some of the other participants and can cheer them on or moan with them about your tournament sessions. 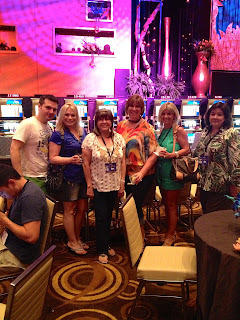 After the tournament sessions for that day we all went our separate ways. 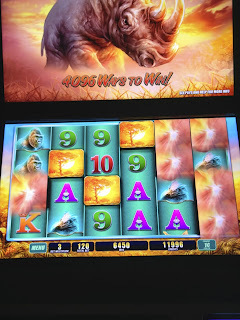 Randy and I were having a hard time winning anything at Aria and with almost all the slots we like being specialty slots we couldn't even console ourselves with making express comps because it's so difficult to get any with their new point system. 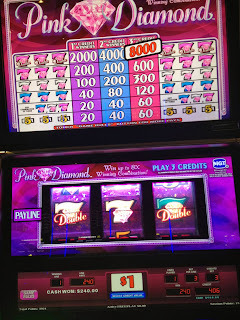 Fortunately we had some brief luck with Pink Diamonds again, one of the few slots we play that actually give us points too. 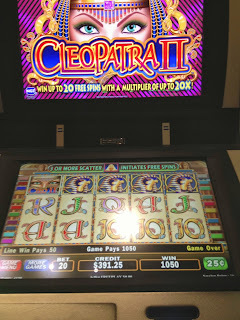 Had a decent hit on Cleopatra II but later when we hit the bonus it only paid 350 or so credits! Love the Twilight Zone slots but could never find the two at Aria in bonus mode. 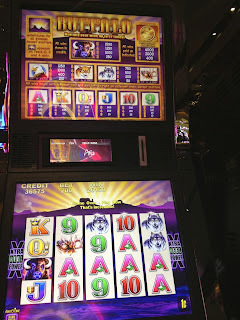 We had some bonuses on $5 Top Dollar at Aria but at $15 a push the bonuses of $50 and $75.00 were a slap in the face so we decided to take a break and go over to Venetian for dinner. Dinner for us at Venetian will usually translate into dinner at Tao where Randy ordered his favorite the lobster and shrimp rolls. We both enjoyed the garlic green beans and asparagus tempura, along with "shocker" the miso glazed Chilean Sea Bass with wok veggies. We split our favorite dessert the giant fortune cookie with vanilla and chocolate mousse inside. 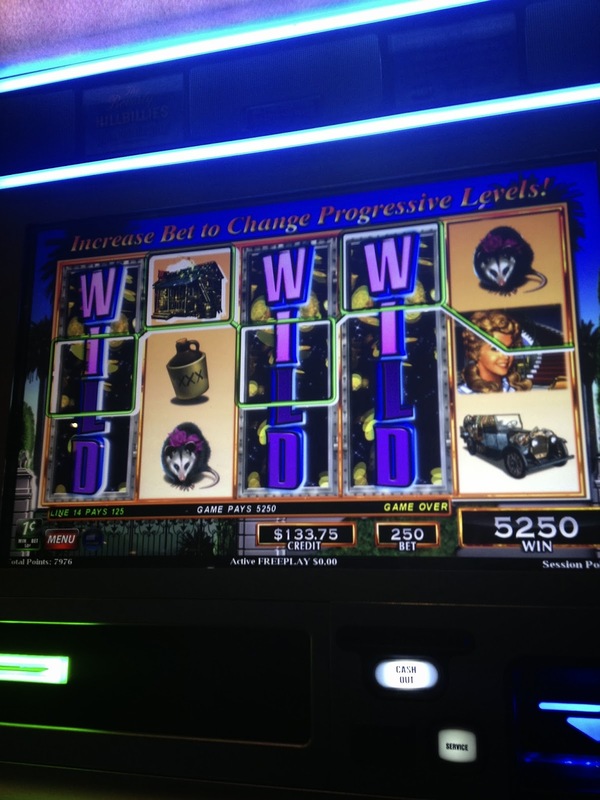 After dinner at Tao it was time to introduce Randy to the Willy Wonka slot! 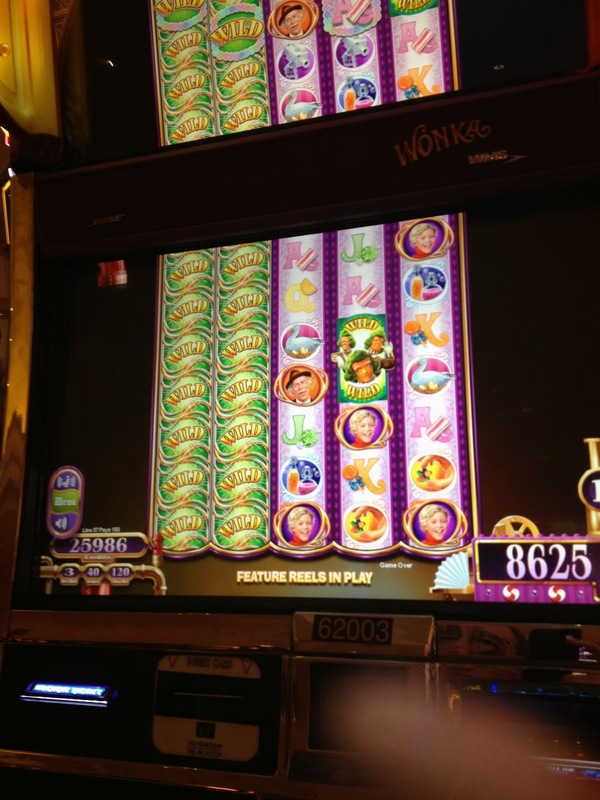 Unfortunately Wonka wasn't showing us any big wins that evening but we did have a few fun bonuses. We couldn't get lucky on Top Gun or the original Wizard of Oz at Venetian but I did have one good bonus on the Hangover slot there. Walking over to Palazzo I couldn't resist a couple photo ops with the Carnevale Characters. I have quite a few from this summer but I just get such a kick out of them. This was also the last weekend of Carnevale. So why this photo? Sadly instead of the slots I expected to have been put back in place at Palazzo near the player's club desk the poker tables were being set up again! Aria doesn't have Clue so we played it for a while at Palazzo but my biggest win below wasn't that great. 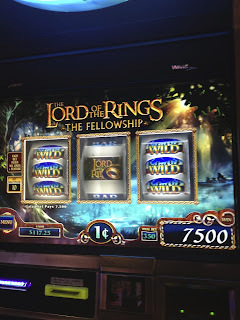 Lord of the Rings at Palazzo gave us a few fun bonuses before we left to return to Aria. 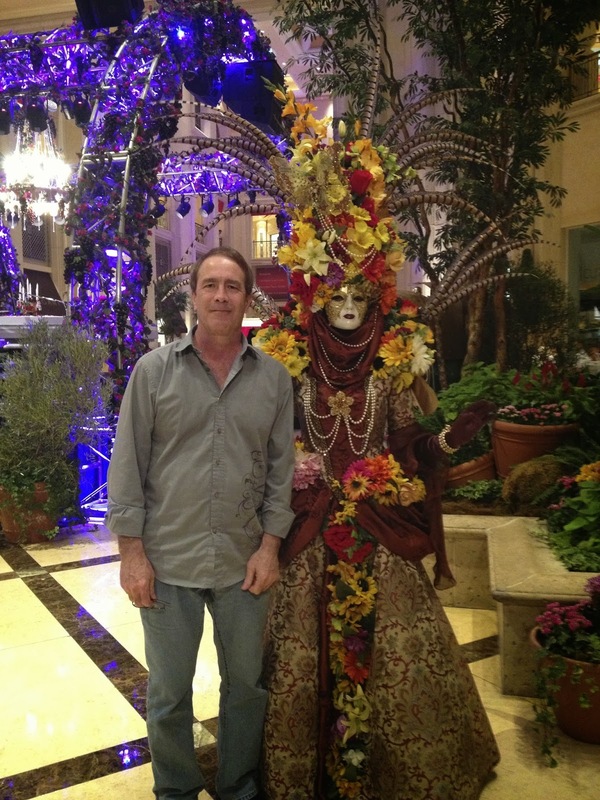 During our time at Palazzo Brian was texting me to come back and for us to go slotting with him. 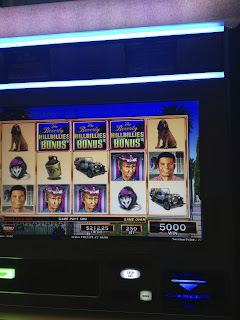 Once we arrive back at Aria no more texts so we start to play a slot over by the high limit room when Randy turns to me and says "I hear Brian screaming bonus". Sure enough we found Brian by following the sound of his voice! 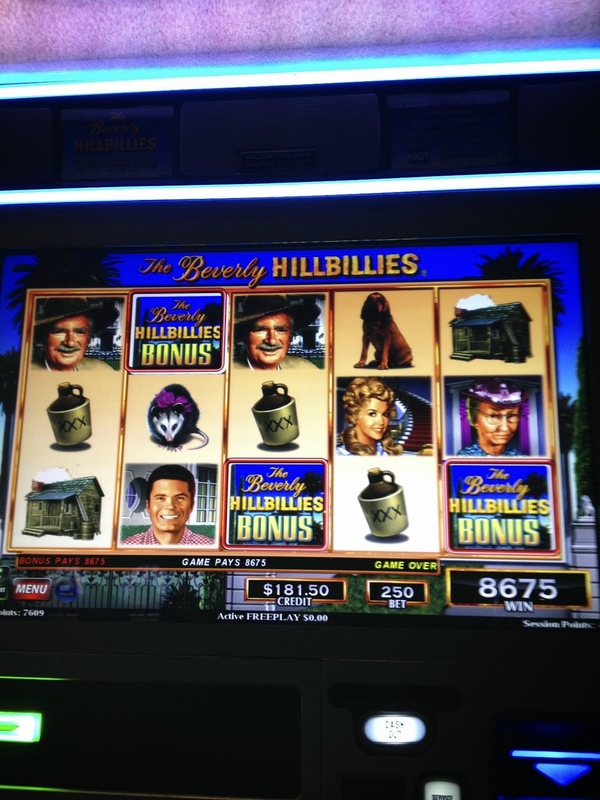 He was with some friends playing the Beverly Hillbillies slot. Brian and a couple of his friends decided to go clubbing instead of slotting but first he took us back to his room to give us a bottle of champagne his host had gifted him with that he wanted us to have since he doesn't drink it. 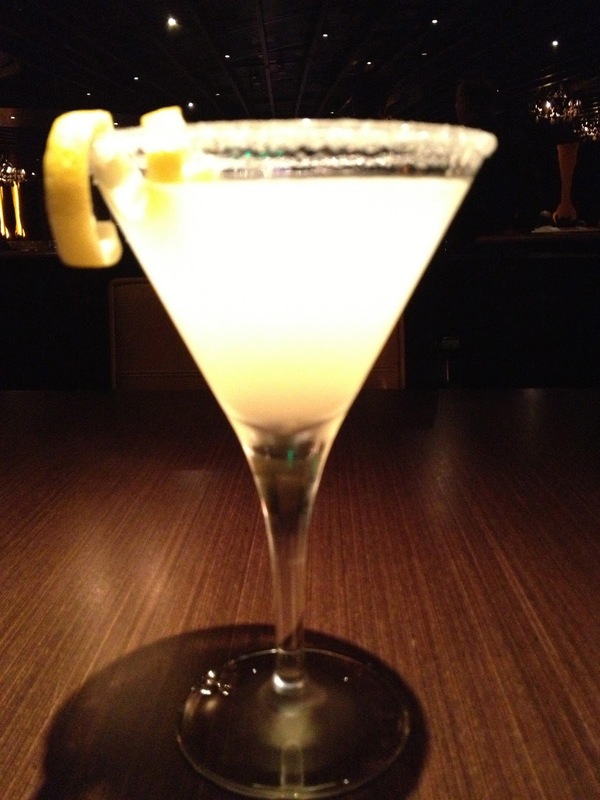 Thanks Brian, we did enjoy drinking it! 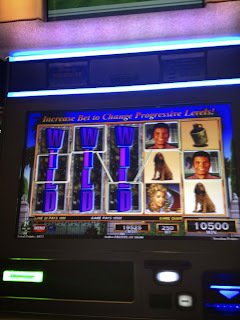 After splitting up with Brian and his friends it was time to seek out and search new slots to lose on. 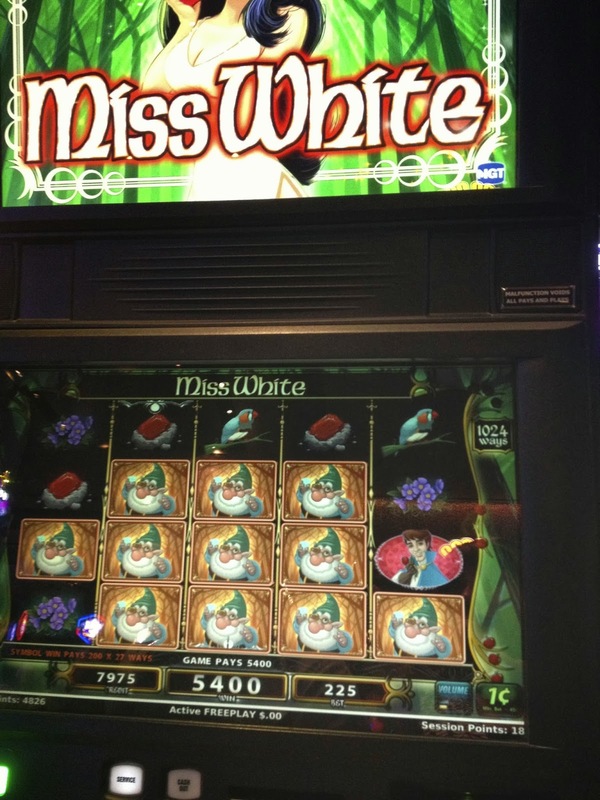 Miss White gave us a bit of play, but most of the wins seem very low. 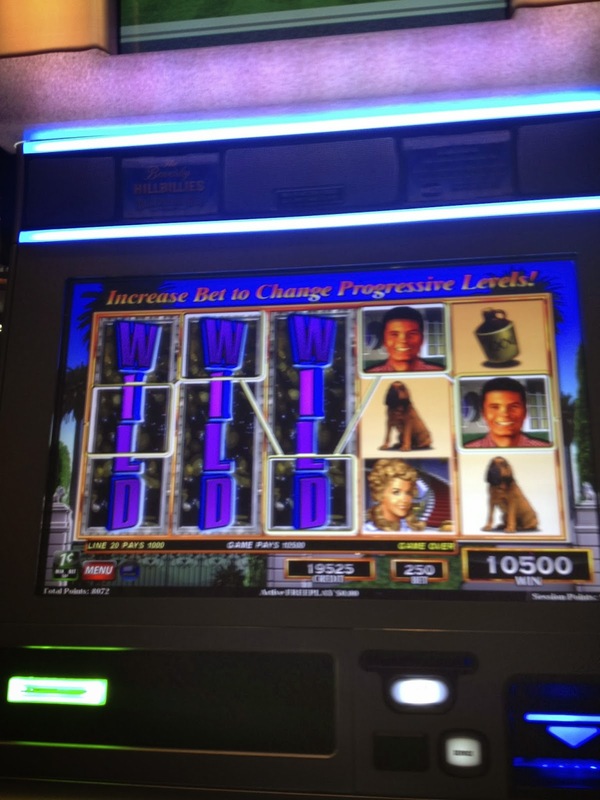 The music on this slot is very loud too and we couldn't find a way to turn it down and eventually had to leave it because we couldn't stand hearing it the same music over and over again. 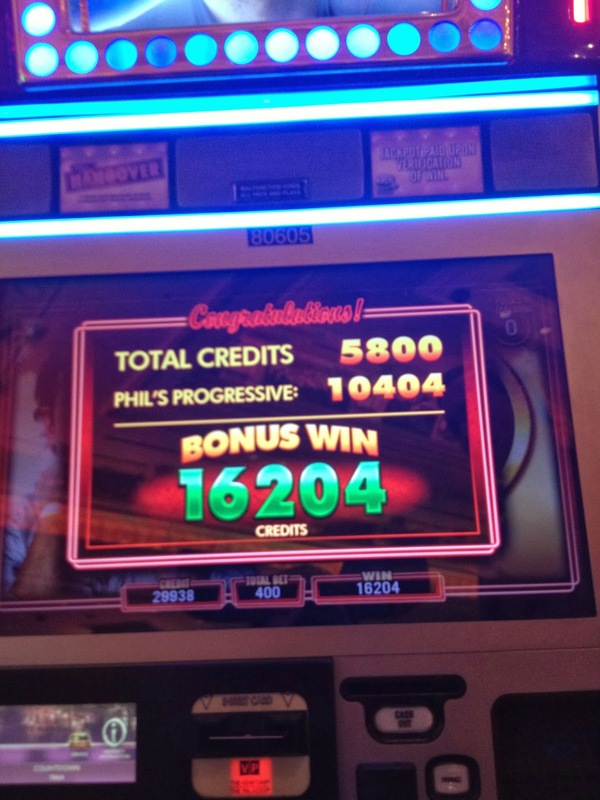 One of our sad bonuses on $5 Top Dollar. The lady next to us on the other $5 Top Dollar X2X2 slot was hitting for $300, $600 and so forth. 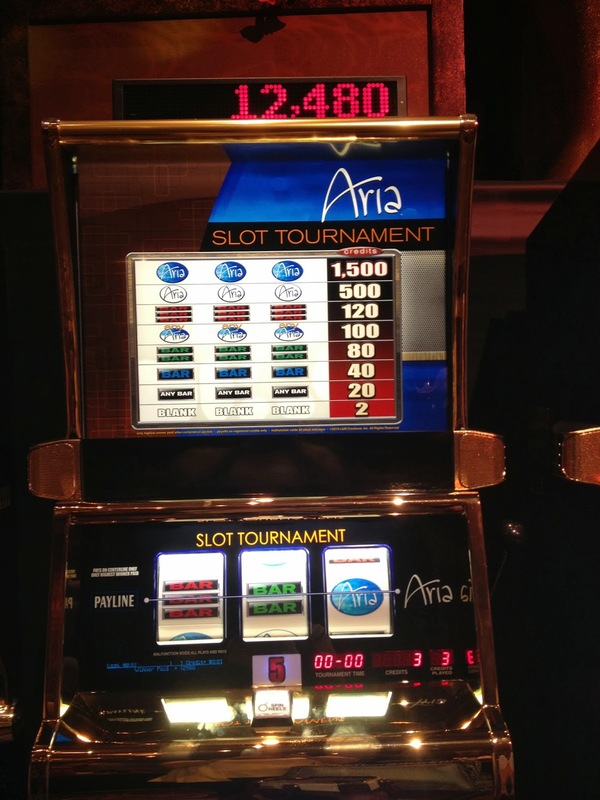 At various times we would return to the $1 Top Dollar in Aria's high limit room and try to keep a lucky streak going on it. 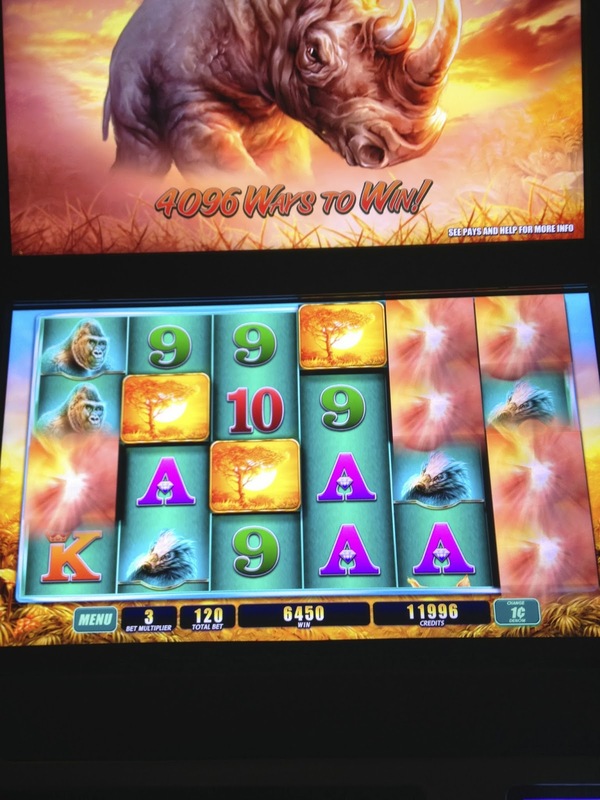 Unfortunately our streaks didn't last long but at least with this slot it's not considered a specialty slot and we could get some points on it. 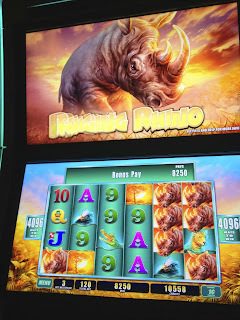 We tried a Raging Rhino slot for the first time and were low rolling on it and had a nice hit. Eventually though we got tired of losing and went back to our suite around 1am to admire the nighttime glitz of the strip from our bedroom windows. 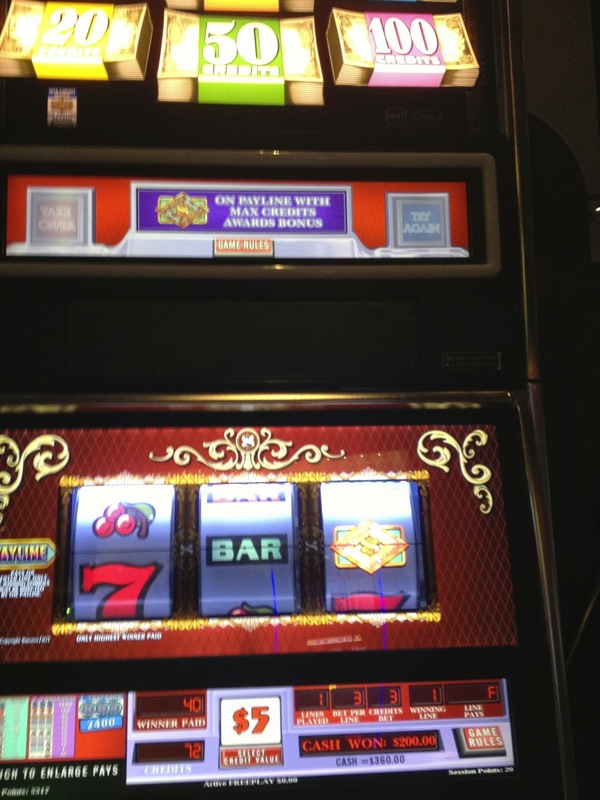 Saturday morning we again had our first slot session at noon. 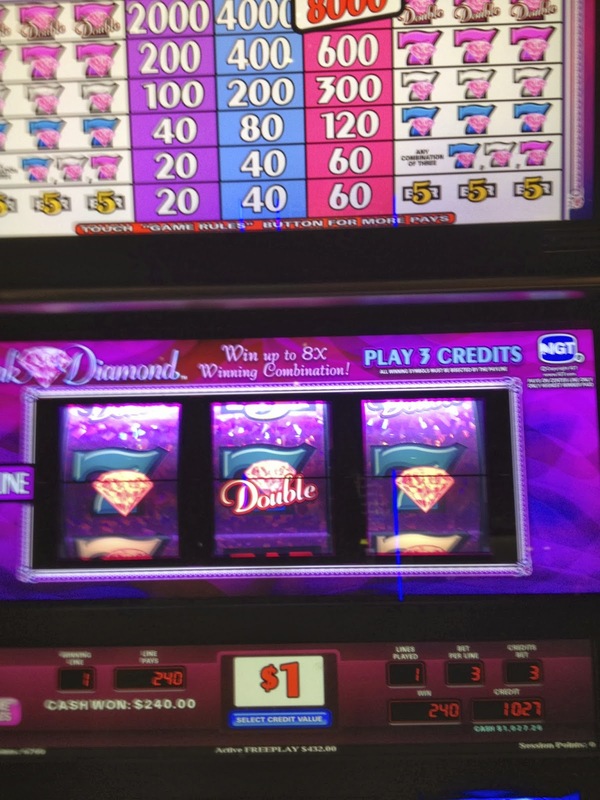 I had a respectable 3rd and last score. 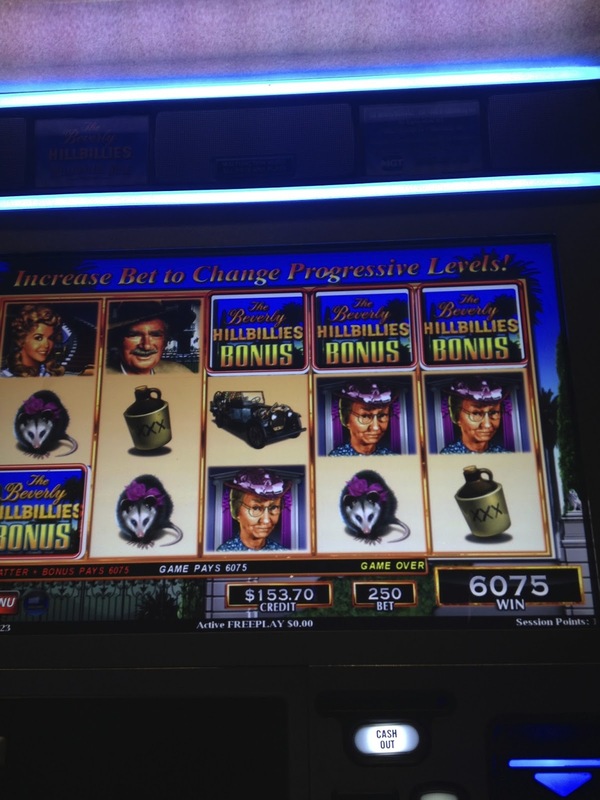 The tournament had a option to buy in with another $500 and have your lowest score deleted but we already knew that even with the 3,000 score deleted and possibly a good one replacing it we were not going to get first place. 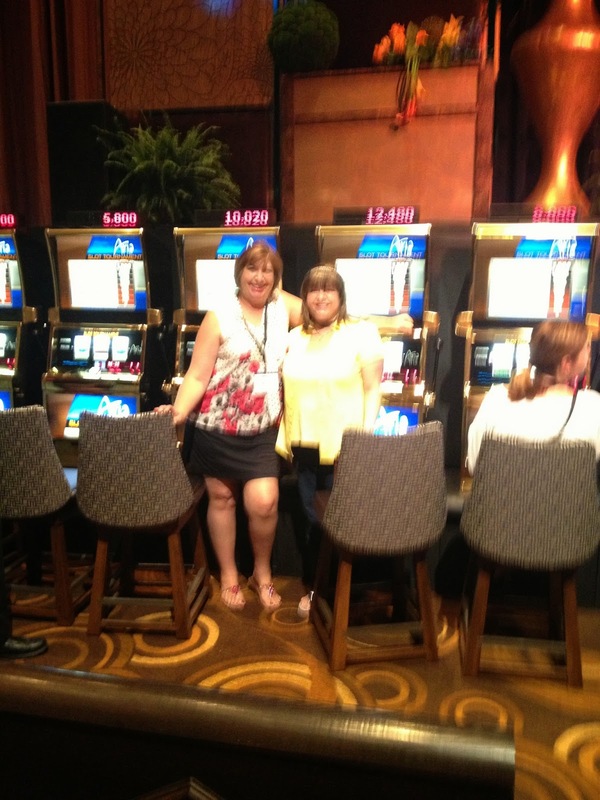 Brenda (Brensan) from vegasmessageboard and I were seated next to each other in our final slot sessions so we had fun chatting the whole time we were hitting our spin buttons. There was a wide selection of food today. 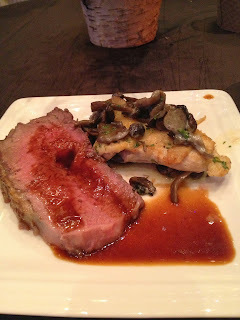 The chicken piccata type dish with mushrooms was very good. Lots of pasta and salad type dishes. I had some of the roast beef and it was excellent. 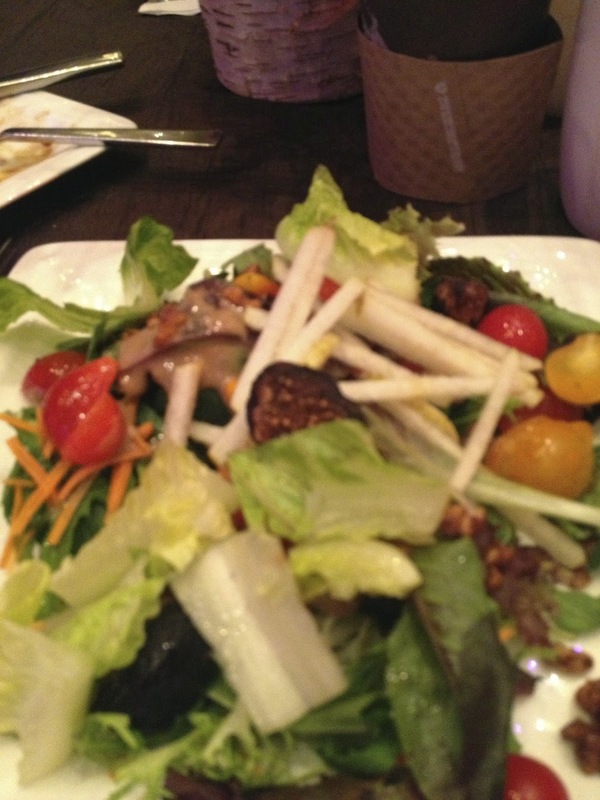 Below someone's salad they had made. 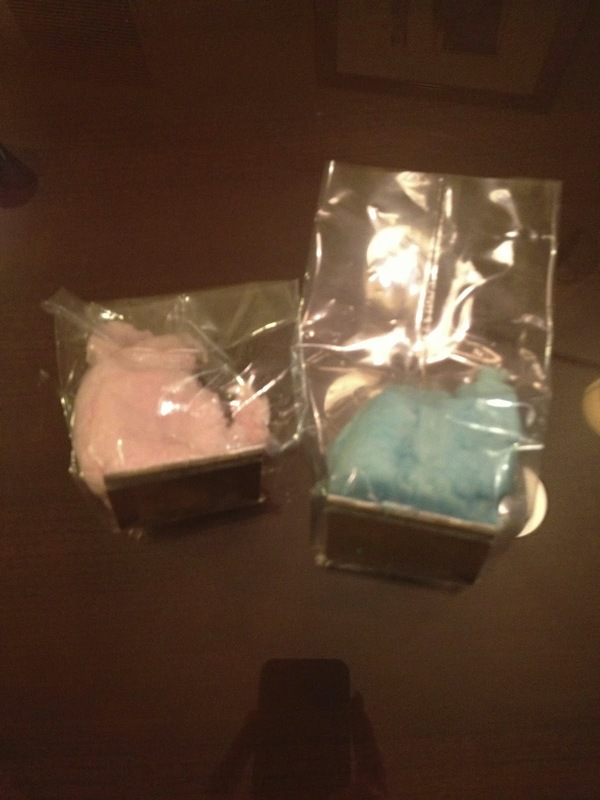 Among the desserts was cotton candy so we took a couple pieces back to our room for later. 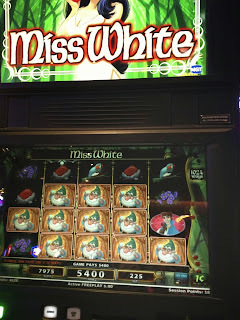 Kimsa's 3rd session wasn't as good as her first two sessions but she had a shot at winning so she bought back in to the tournament. 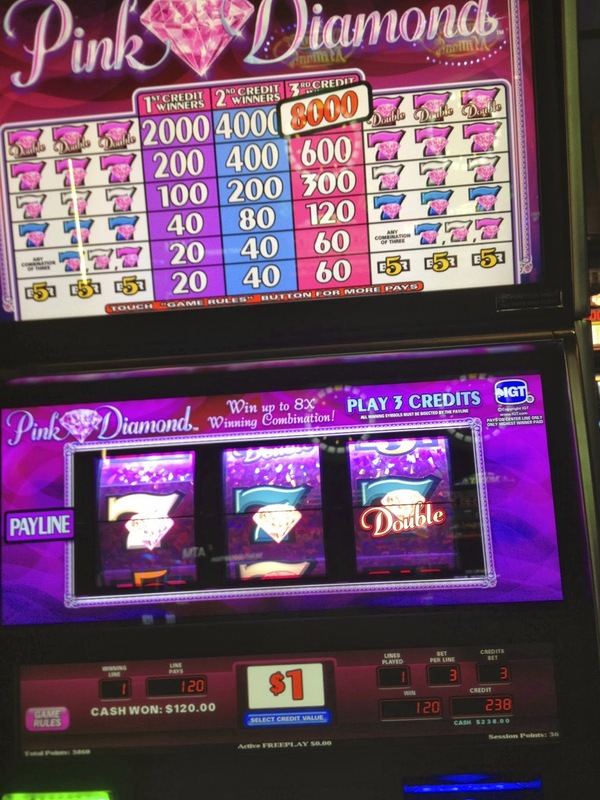 Unfortunately her extra session wasn't good enough to win with. After the tournament sessions were over with we headed back down to the casino to play. 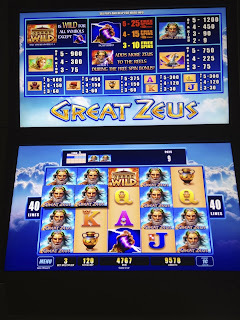 I had tried Great Zeus this summer at Wynn and couldn't get any wins on it, but low rolling it at Aria I had a few decent hits and bonuses on it. Returned to low rolling on Raging Rhinos and did okay. 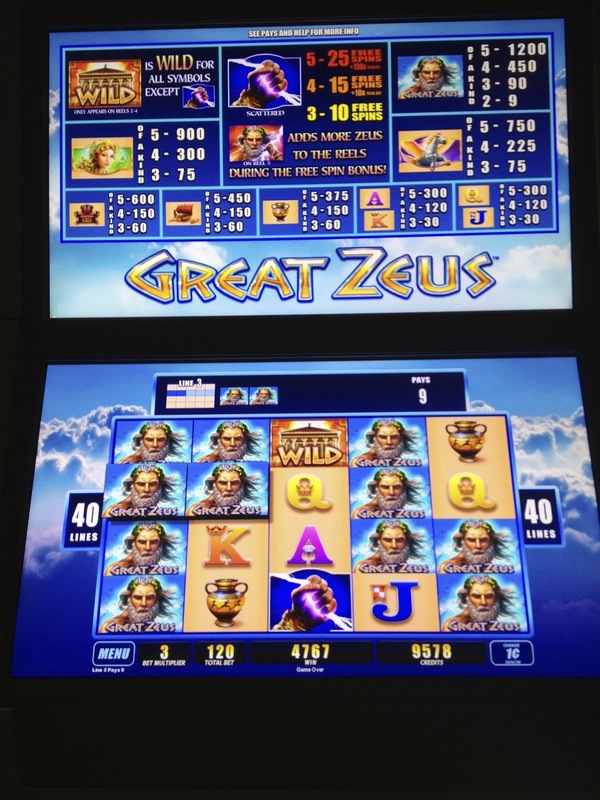 Seems like with Great Zeus and Raging Rhinos I do better by low rolling on them. 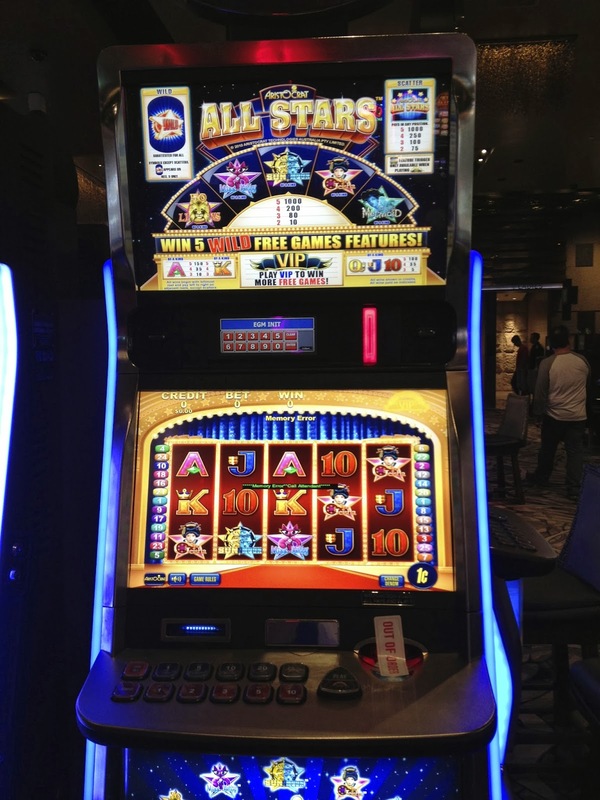 We found one lonely VIP All Stars slot by Aristocrat and had a lot of fun with it for a while. 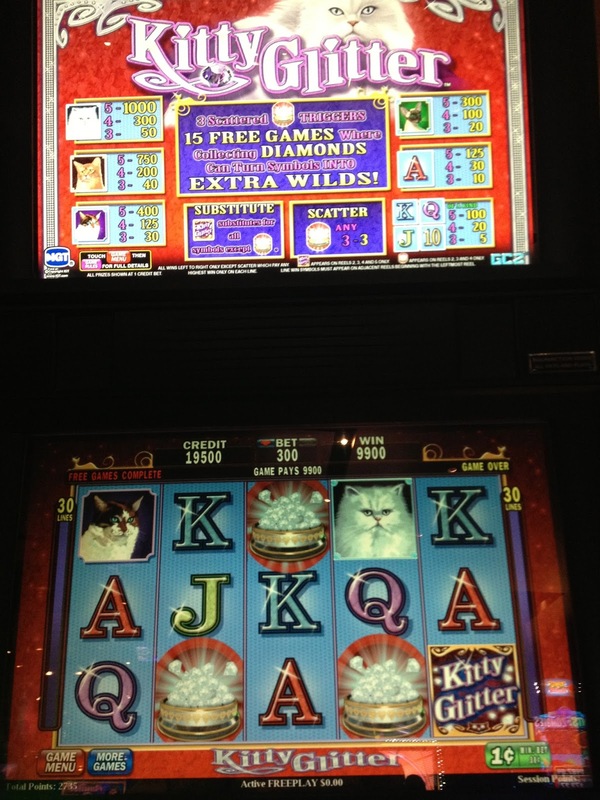 Hit a Miss Kitty bonus on it that was a good one. Here's the video if you like Miss Kitty. 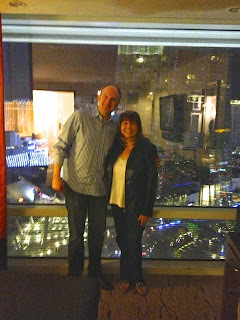 After playing slots for a while we went to the Sky Suites VIP area so Randy could get a snack and a glass of wine and I could work out staying our 4th night in the corner suite we had. 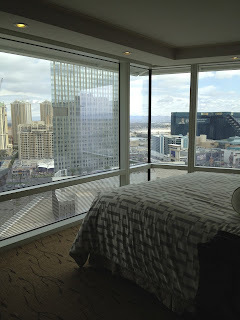 The tournament gave us the suite for 3 nights but I had a myvegas reward for a night at Aria, so I wanted to upgrade that and stay in the same suite without moving tomorrow. 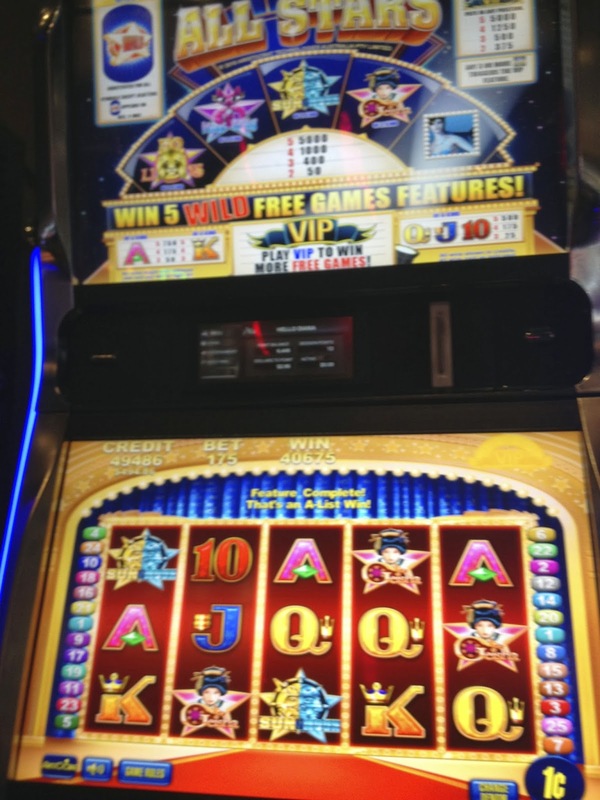 I'll spare you all the details but it took me a hour working with the VIP desk to do this. The lady I was working with did a great job but she had to literally contact about 6 other departments before I was able to upgrade for a fee of around $80.00. 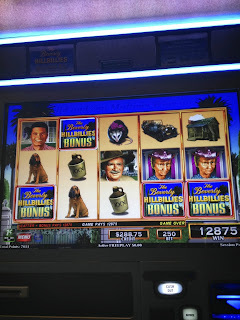 Once I had our myvegas reward upgrade issue solved we went back down to gamble for a bit at the Beverly Hillbillies slot, Mummy and a few others until 5:30pm when it was time to enter the Aria High Limit room for the drawing of holiday gift points and to learn who won. 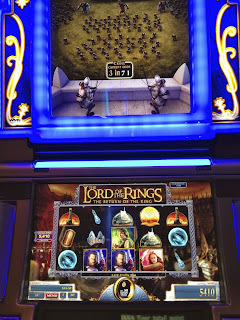 Originally the tournament was to be limited to 150 participants with the first place prize being 150k, but they ended up with 191 participants so the prize was now 191k! 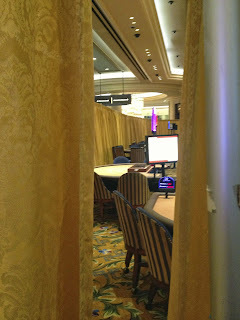 The high limit room was full and it was hard to see anything. 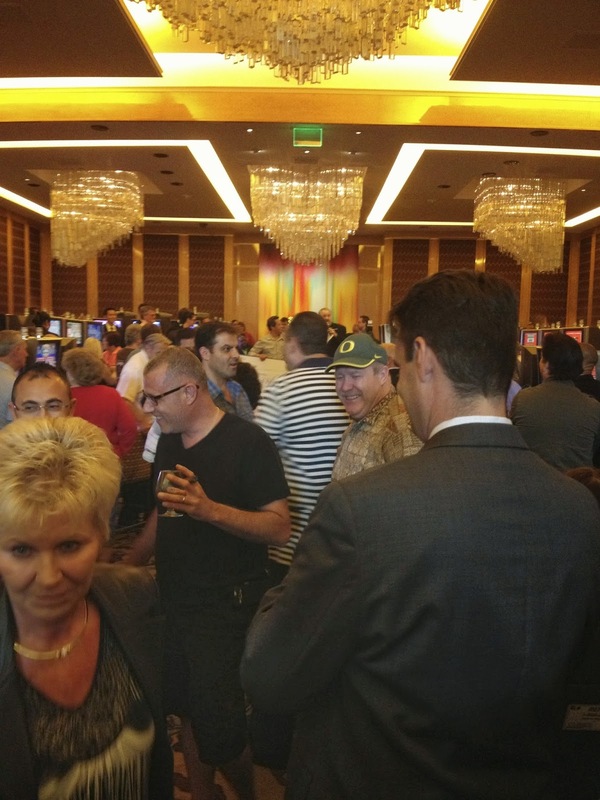 I prefer it in years past when they made the announcement in the ball room that the tournament was held at and it was easier to see and hear. I suspect they no longer do that so they don't have to spend the extra money to have the open bar during that time. 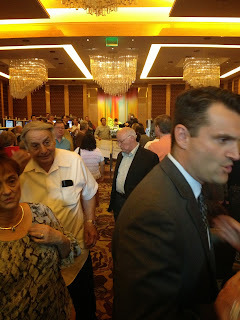 Above in the back holding the large check is the tournament winner. 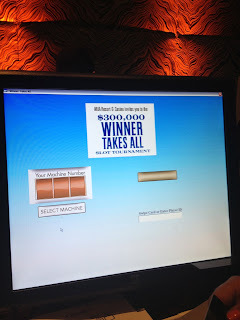 Sadly I didn't know the winner. 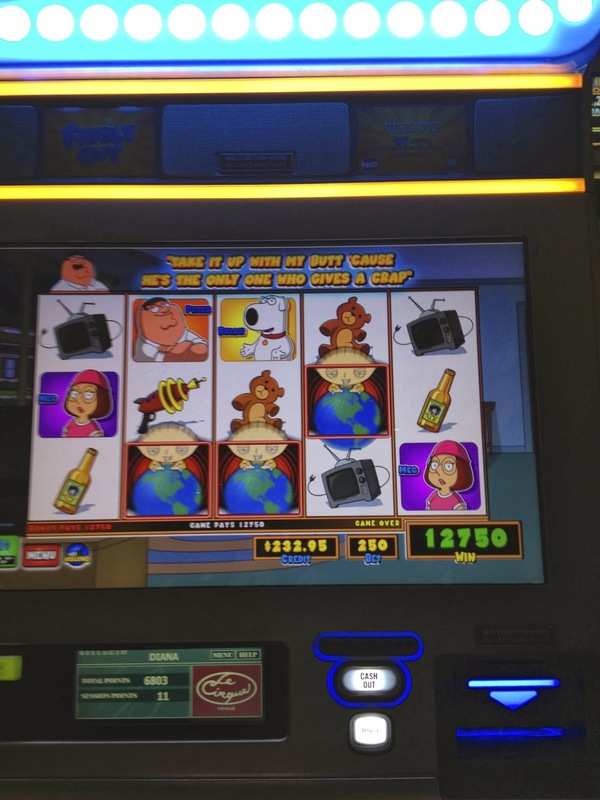 Later that evening though at 10pm they had a drawing for cash prizes using the extra buy in money. 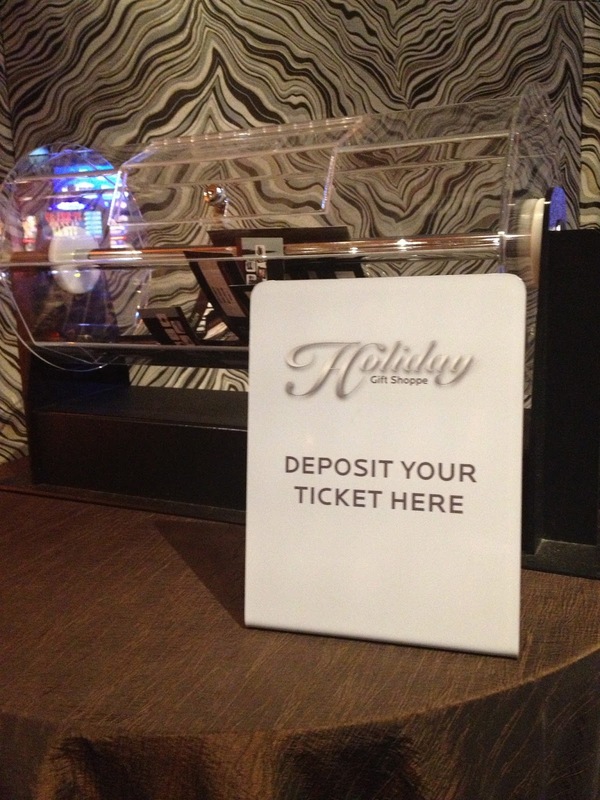 For every 2k points made in play we got a ticket for this drawing. 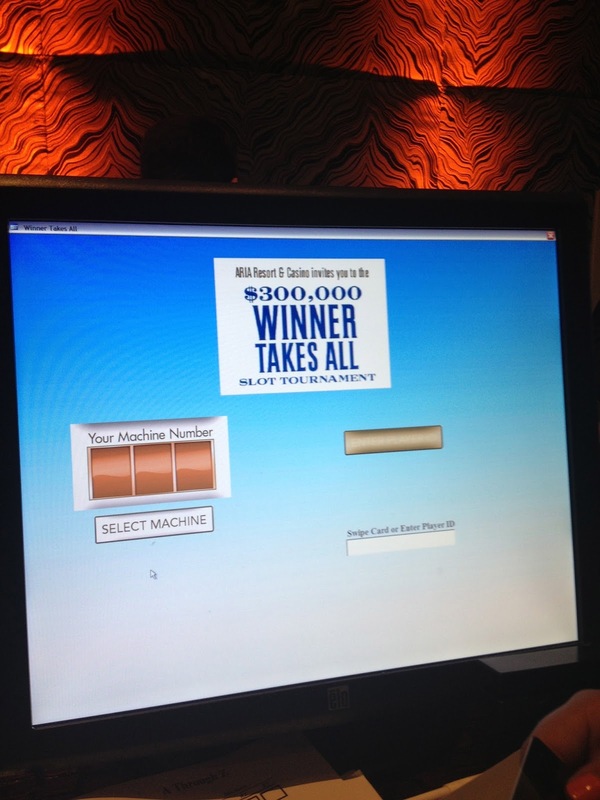 While we didn't win we were excited that Sandy (luvstp) was one of the winners! Our friend Boots had arrived a couple hours earlier to stay one night at Aria. 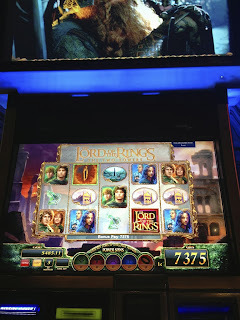 We met up with her, Brian and his friend Michael for some slot play at Race for the Gold and then Lord of the Rings Two Towers before all of us went to dinner. Boots took this photo of Randy, Michael, myself and Brian at Julian Serrano's. 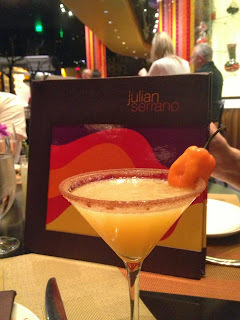 OMG, I love this spicy cocktail that our server recommended. 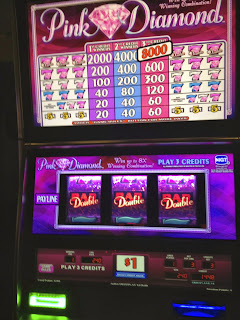 I had two and thought about a 3rd! 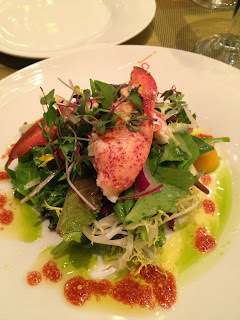 Lobster salad with baby heirloom tomatoes, so delicate and delicious. Mixed baby romaine salad with assorted nuts, berries, dates in a sherry vinaigrette. Boots ordered and enjoyed the tuna cones, such a cute presentation of ahi tartare, cucumber, crispy won ton, avocado with a ponzu sauce! 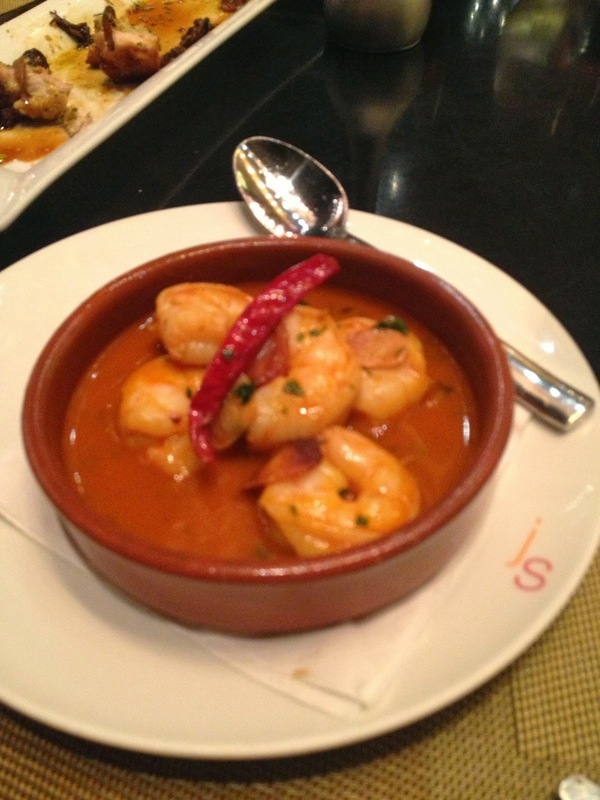 Below is the seared scallops, always love this tapas. 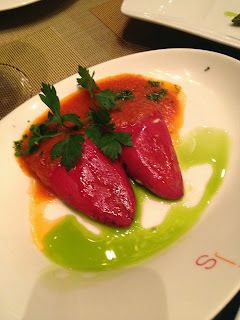 Roasted red peppers, fresh garlic and sherry vinaigrette with extra virgin olive oil! 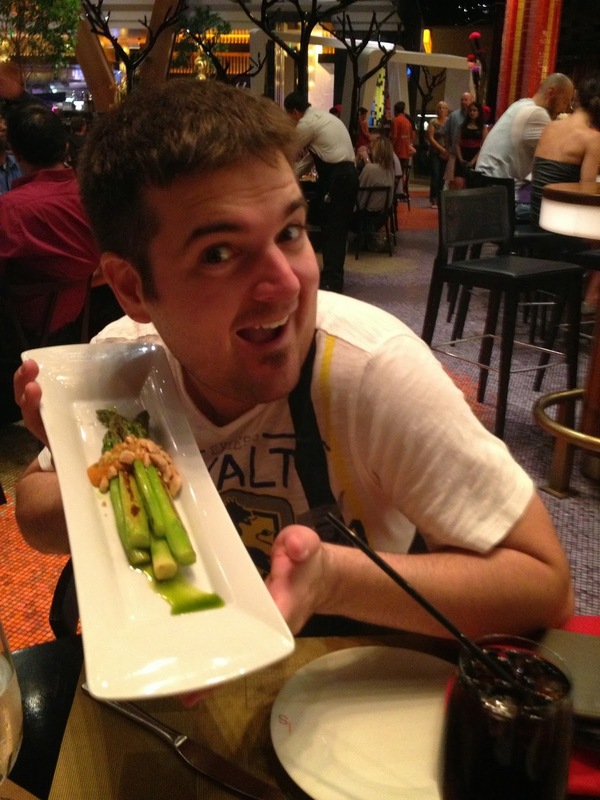 Brian holding one of our two orders of jumbo green asparagus spears with almonds. Gambas, sautéed shrimp with garlic and arbol chills! 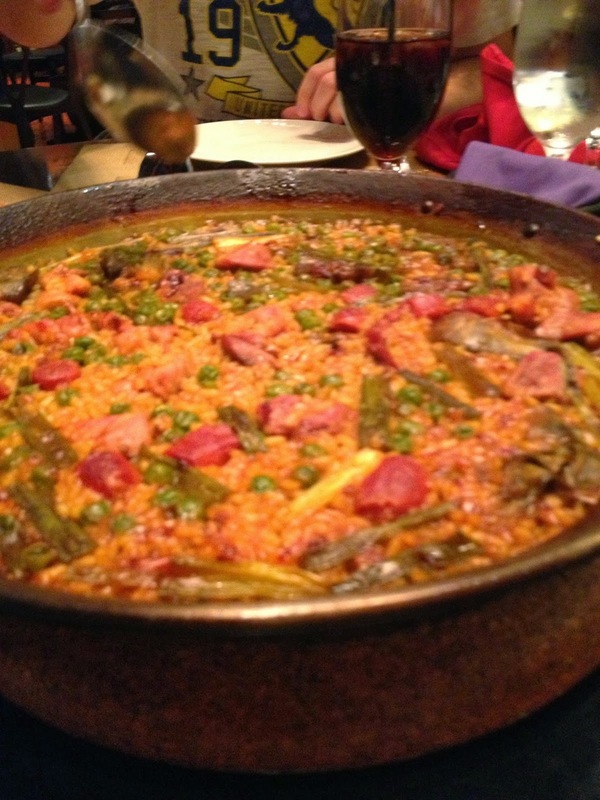 Michael and Brian must have loved their Valenciana Paellas as they finished it all. This had chicken, pork shoulder, pork chorizo, vegetables and saffron rice. 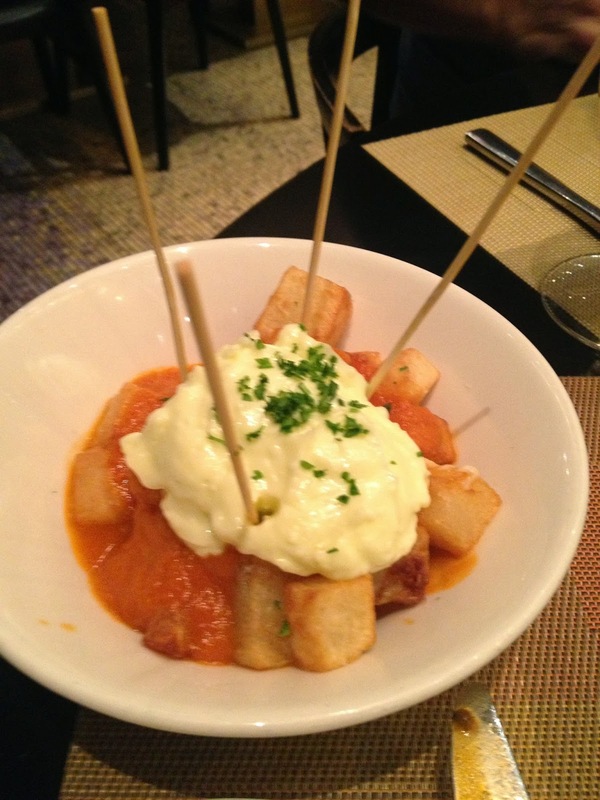 Brava potatoes with spicy tomato and aioli sauce! 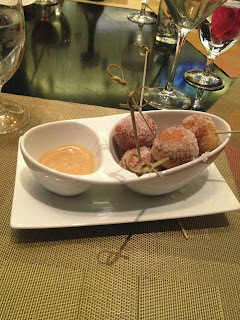 Bunuelos, spanish doughnuts with a butterscotch caramel sauce! 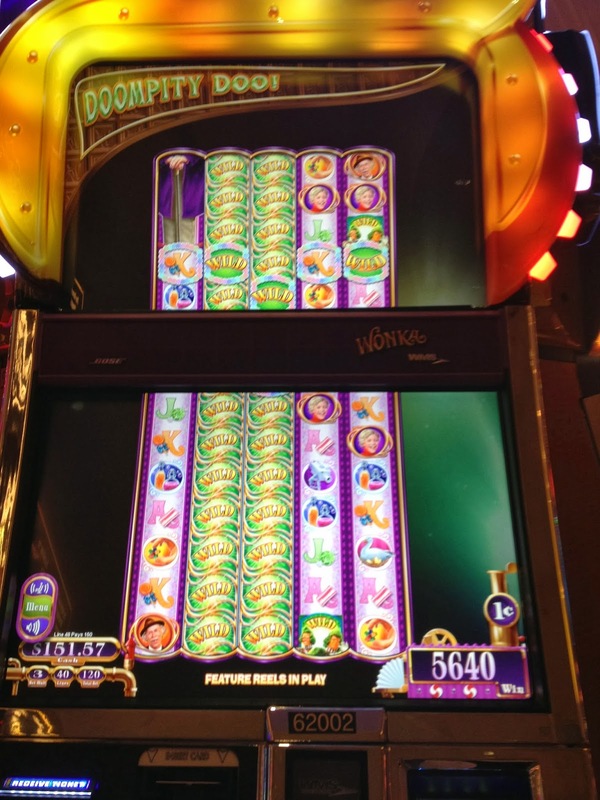 After dinner our group walked over to Bellagio to try out a new slot that Brian had been raving about, Phantom of the Opera. 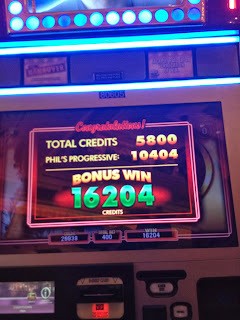 Earlier that day Brian had a lot of fun bonuses and wins on it. 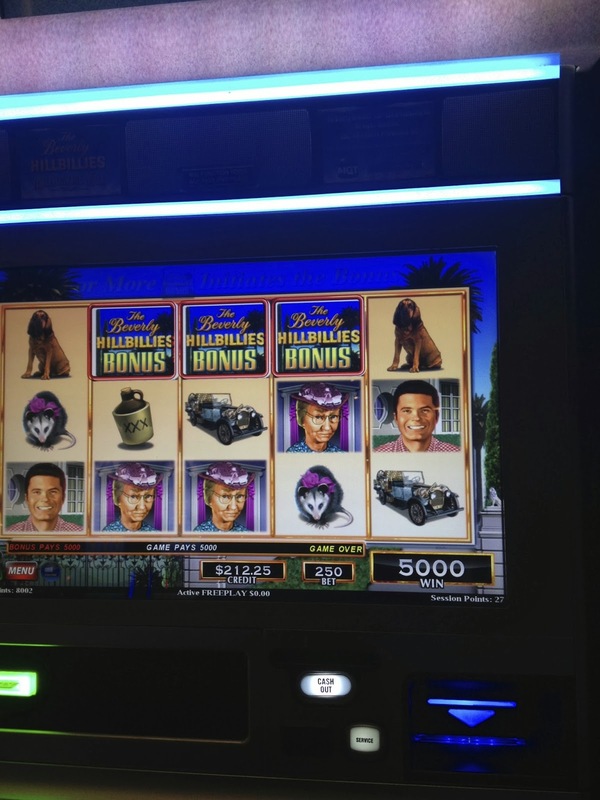 When we got there one of the two Phantom slots already had someone playing on it but Brian nicely let me have the available one. Of course I quickly lost a hundred it in, while next to me Brian was winning on Family Guy. 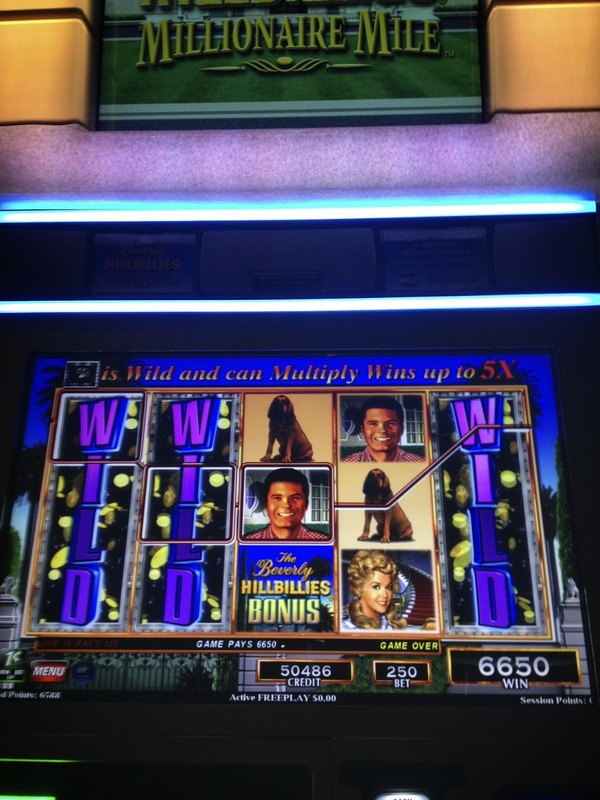 Hey when you're on a lucky streak you win on everything. 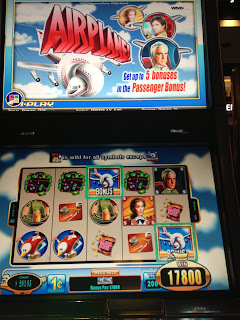 Did I mention that earlier Brian had two hand pays at Bellagio on the Airplane slot? 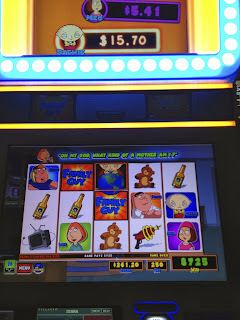 Here's a video of one of my Family Guy bonuses where I actually walked way with more money then I put in the slot! We played a few more slots at Bellagio, but Boots, Randy and I weren't winning any longer so we walked back to Aria. Brian and Michael headed off to a club but shortly returned to Aria due to long lines at the club. 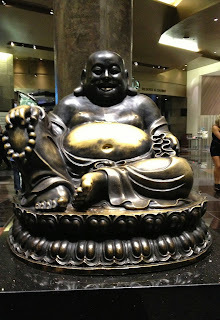 When we returned to Aria we had a quick rub on Buddha's belly and left some coins on him in the hopes of our luck changing for the better. 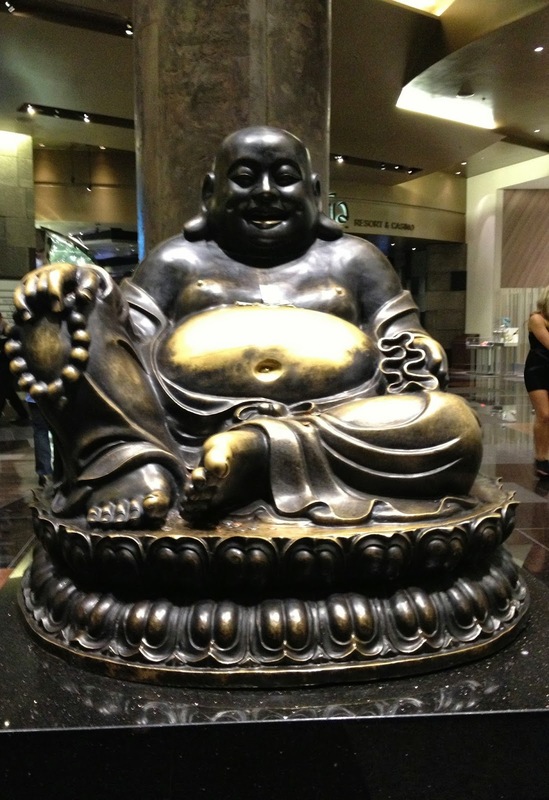 Rubbing Buddha's luck helped slow down our losses, that's about it! 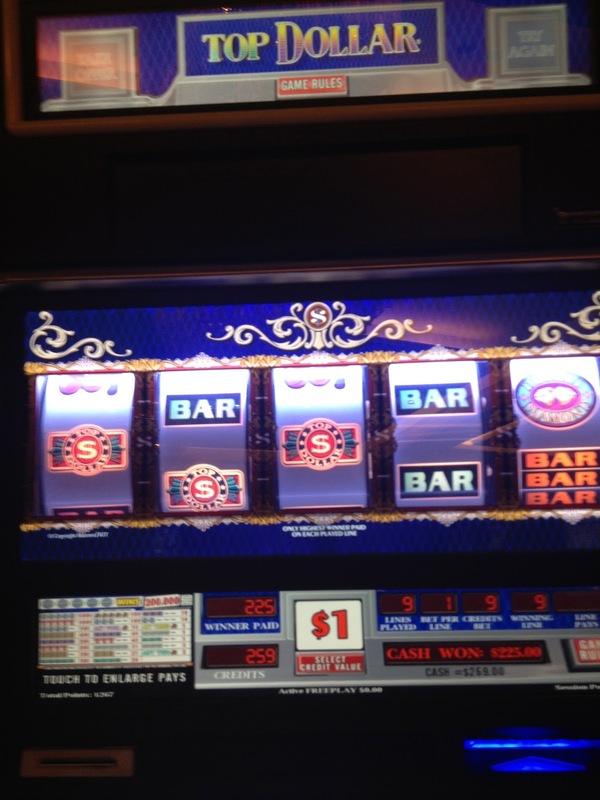 We had some fun wins, but more losses then wins. 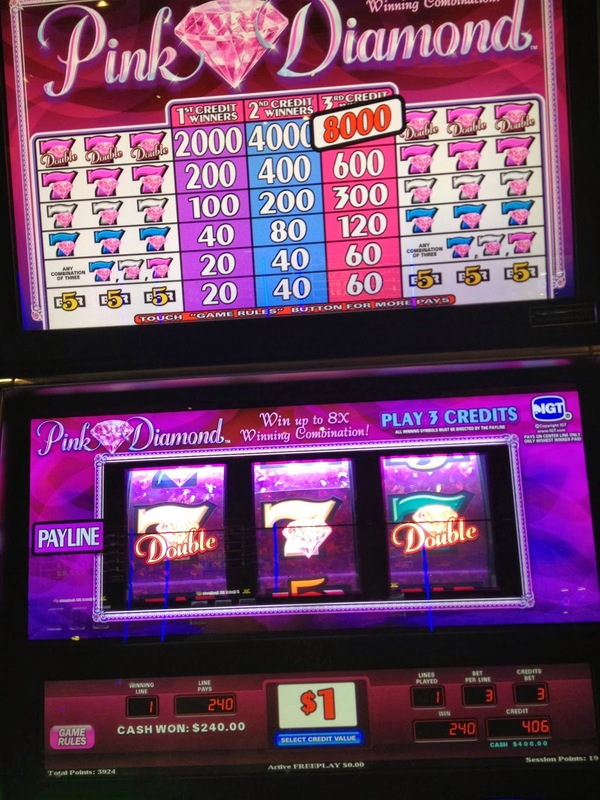 Thank goodness that Pink Diamonds threw us a win now and then! 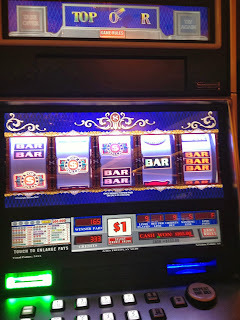 We we had a lot of fun tonight with our friends and our losses had really slowed down thanks to some decent hits, but we said goodnight to Boots around 1am and went back to our suite for some sleep. 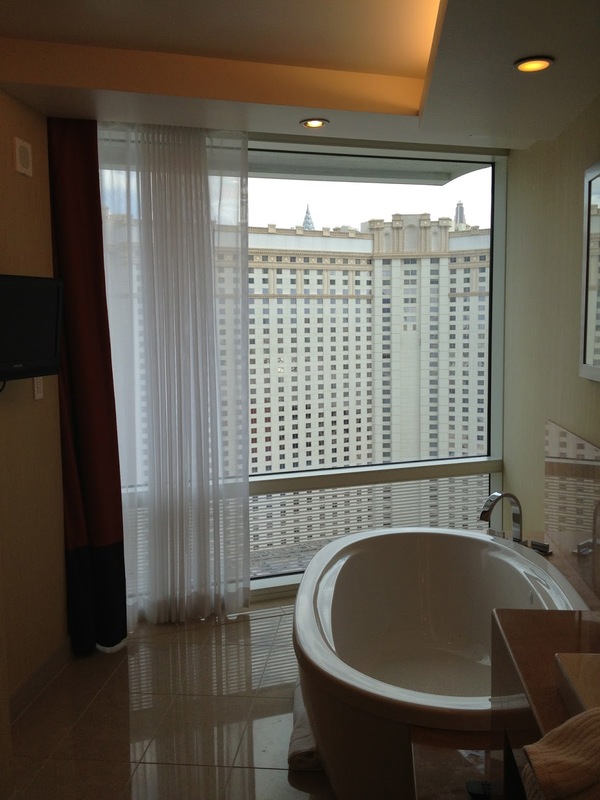 Good morning Las Vegas! 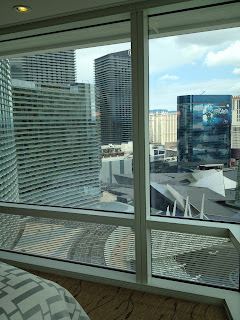 A beautiful view on Sunday from our corner suite at around 11am before we headed out to brunch at Mandarin Oriental's MOzen Bistro! Loved our brunch at Mandarin Oriental's MOzen Bistro. Read all about it with photos at this link on my blog. After enjoying Mob Attraction we walked over to MGM Grand to search out the new Lord of the Rings slot, The Return of the King! 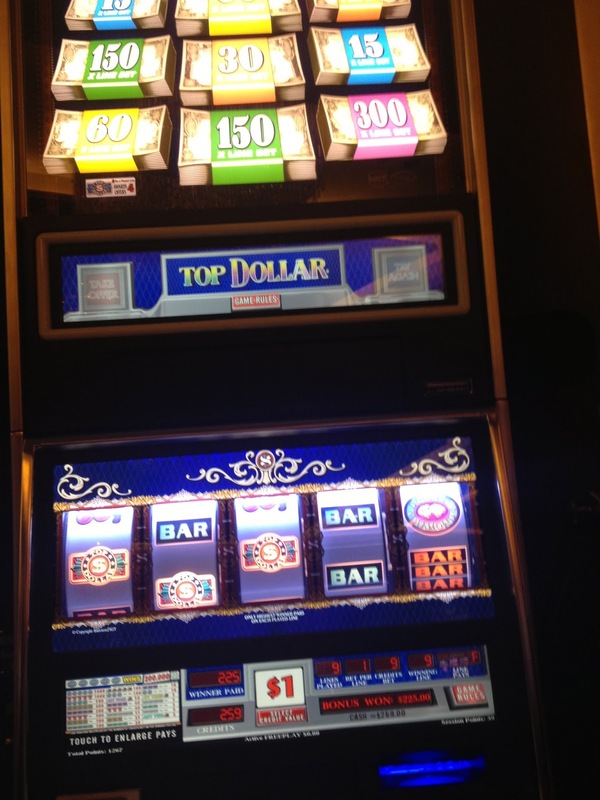 We low rolled on it and quickly lost $100. 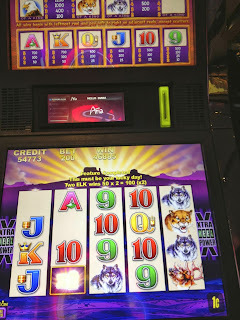 However during our play we were collecting rings that we could get spins from and when we used them we started to see some potential to this new slot. Here's a video of those spins if you are curious. 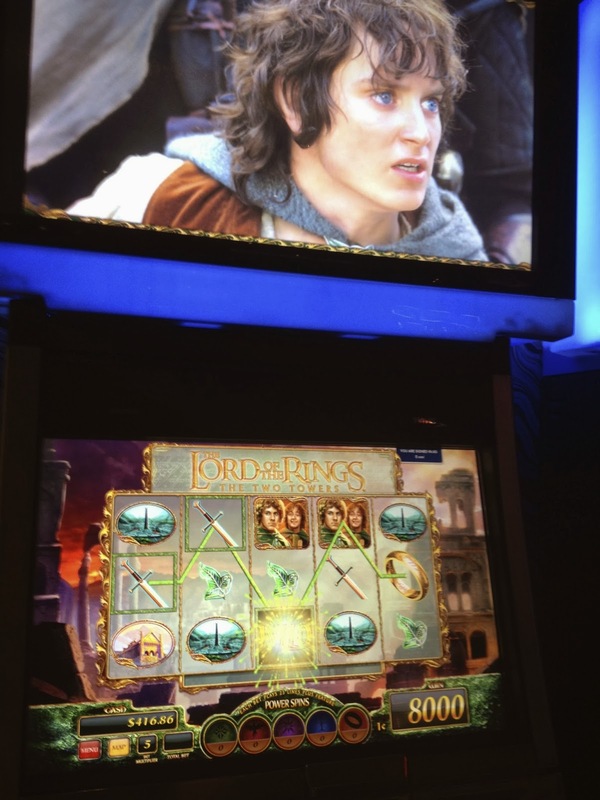 After finishing playing Return of the King we were hungry. 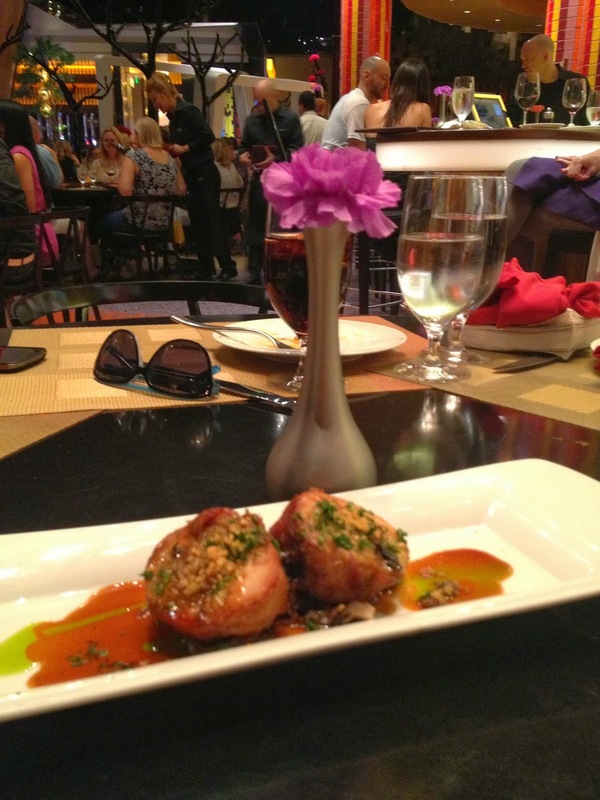 Originally we were saving tonight to have dinner with Terri, but she wasn't feeling good so we decided to go to Bellagio's Sensi restaurant. 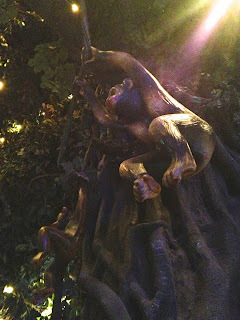 However we were so hungry as we started the walk from MGM Grand to Bellagio that we stopped at the first restaurant we passed Rainforest Cafe. 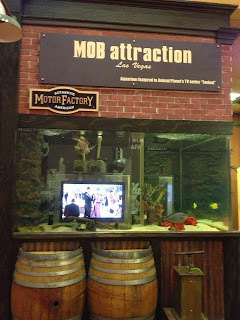 We had to briefly wait in line for a table but enjoyed watching the fish in their 10,000 gallon salt water aquarium. We had a monkey swinging above our table! Or in other words looking straight up my husband had a great view of a monkey's behind! Volcano cobb salad with chicken, blue cheese, chopped eggs, carrots, bacon and balsamic vinaigrette dressing. 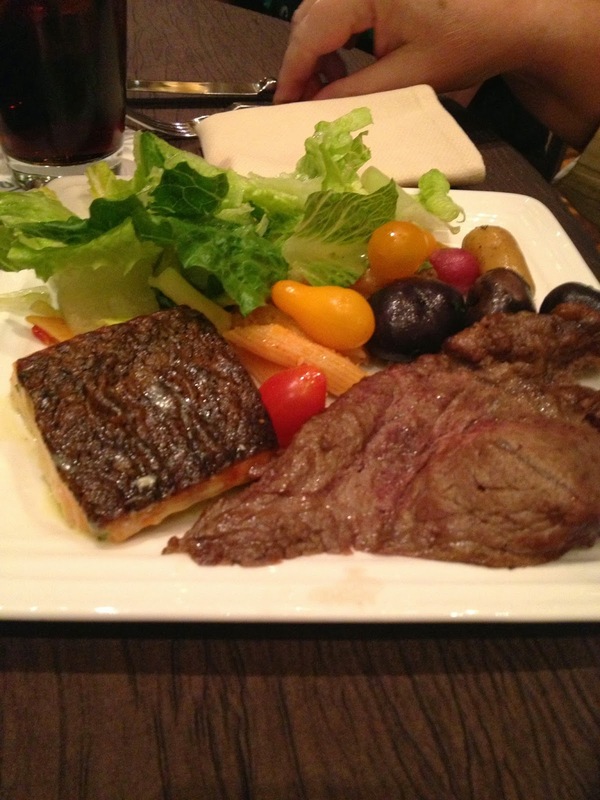 Also suppose to have black olives and tomatoes but Randy asked them to leave them off. For dessert we shared a half portion of chocolate indulgence which was a yummy concoction of ice cream sandwich, fudge sauce, whipped topping and a Heath bar crunch! 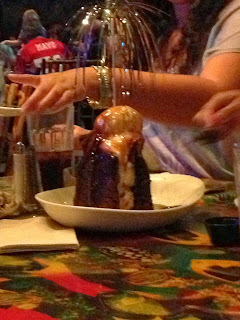 There's a dessert on the menu for around $12 called the sparkling Volcano which is a chocolate brownie cake stacked up high with vanilla ice cream, whipped topping and finished off with caramel and chocolate sauces. 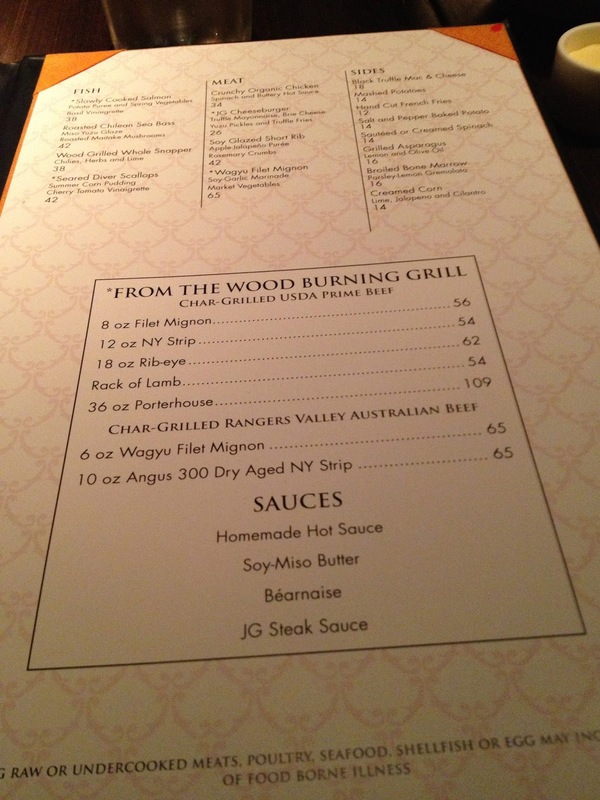 We didn't order it but the table next to us did so I grabbed a photo of it. The table of 4 ladies could not finish this dessert, it's huge! 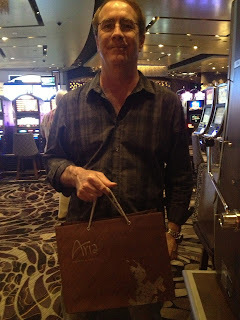 After our dinner at Rainforrest cafe it felt good to walk back to Aria. 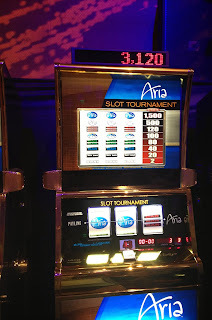 Once back at Aria it was time to play a few of our favorite slots to see if they wanted to send us off winners. They didn't, oh well. 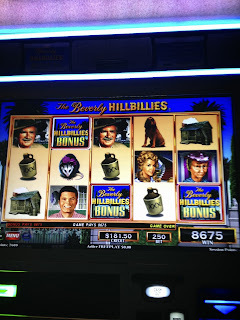 :) We had a fun time with the Beverly Hillbillies slot again though our wins were modest. Around 11pm we left to meet Jonathan (jraindc) a friend of mine from vegasmessageboard at the Deuce lounge for drinks, but it was noisy in the bar so drinks in hand Jonathan joined us in our suite for a chat. 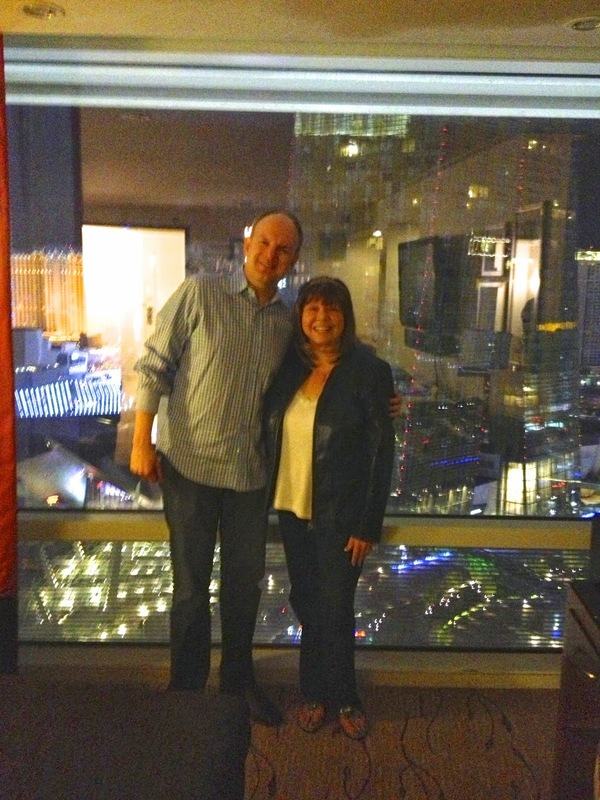 Jonathan and I had met earlier this year around the beginning of February at Palazzo when he recognized me from my blog. Correction, I guess I should say that Jonathan and I had a nice chat in our suite, while Randy had to do some work for a hour on his Ipad, though he did break off long enough to snap a photo of us. 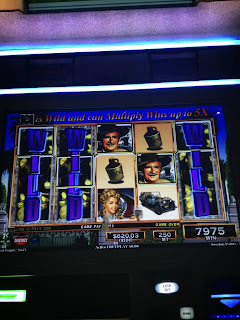 It was fun to see Jonathan again and I'm sorry that I won't be in Vegas around Veterans day this year when he returns to celebrate a land mark birthday with friends! 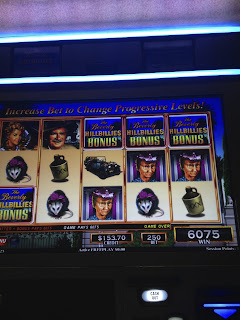 After Jonathan headed back to his hotel, Randy and I returned to the casino to use our point play up for the trip.We had some fun again with Beverly Hillbillies and came close a couple times to winning the Gold progressive only to land one space short of it on two of the Millionaire Mile bonuses. Our point play didn't last long so we soon found ourselves back at our suite around 1am and packing up for our early morning flight. Monday morning we checked out and had a safe and uneventful flight home. A fun trip due to the great restaurants, Mob Attraction and more importantly seeing Boots, Brian and other friends! 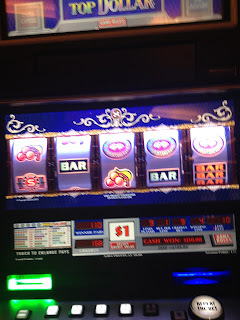 Would have been nice not to return home a loser, but this year I'm getting used to it. 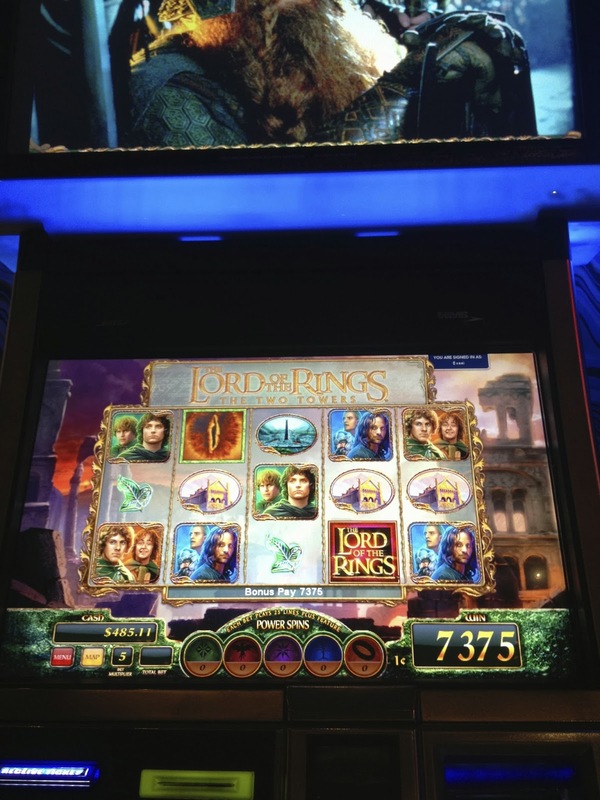 Next trip is September 23rd for the Global Gaming Expo (G2E). I always have fun seeing the new slots and getting a chance to play them for free. 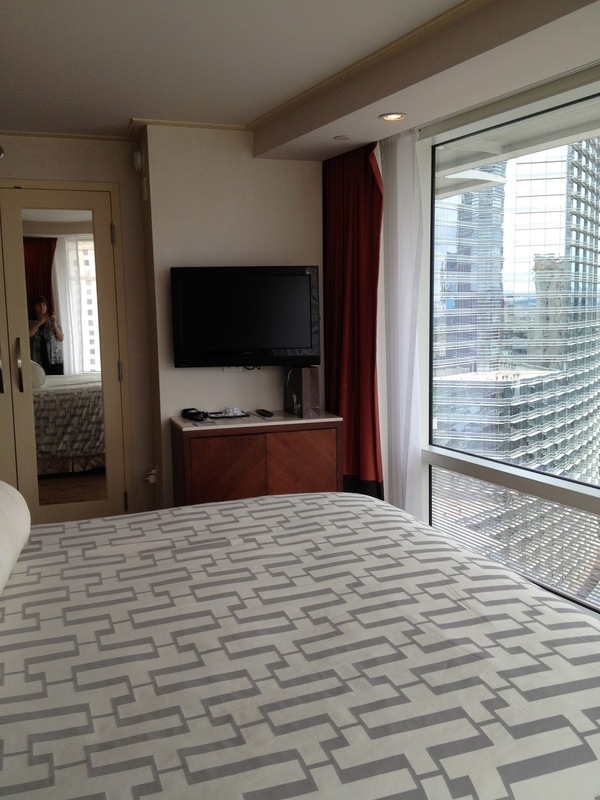 I'm staying at Palazzo for the convention and then taking 2 nights at Cosmopolitan since my friend Boots will be staying there. 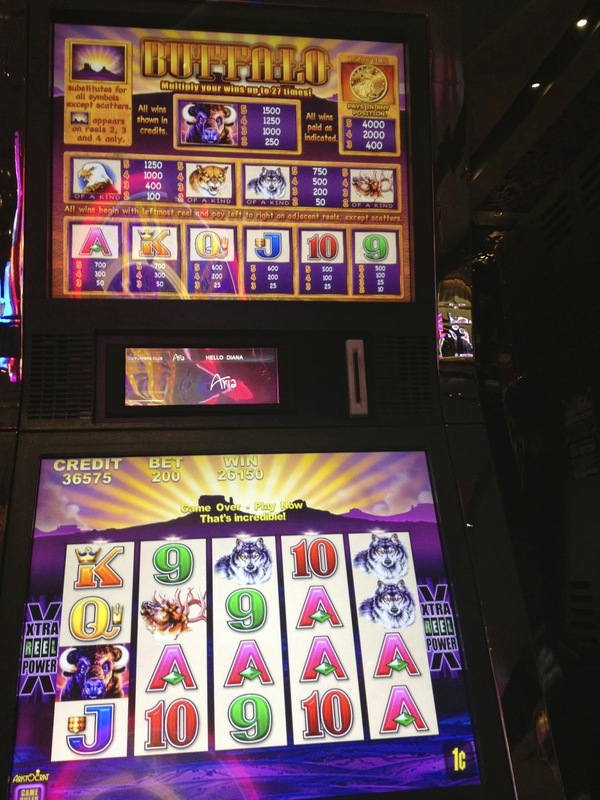 Lots of other friends like Gwen, Shamus, Slotspert, Boots, Slotnoodles, Interception Geek, and others will be in town either for G2E or Vegas fun. I'm especially looking forward to seeing the Craig Ferguson show again as it's been three years and he's always so funny. Good luck on your next Las Vegas Trip, and cheers! 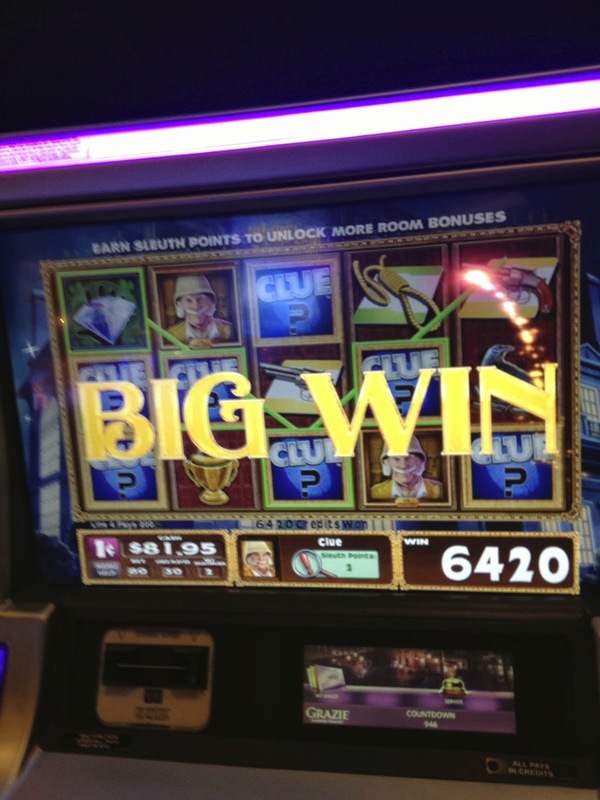 Thanks for the shout out and pictures. I hope to see you soon! 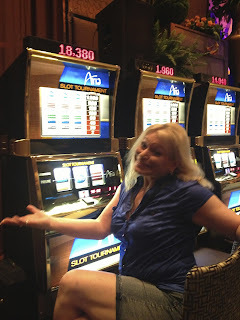 Hey Diana..OMG..the slot tourney looked like soo much fun!! !..Do you know if they have one in the spring?..WOuld love to get in but i am sure they will send me invite if there is one..BTW Ill treat you to some miso glazed sea bass if Im there LOL..You and ur husband have it so often it HAS to be good!! Have fun at the EXPO!! Thanks Mike. 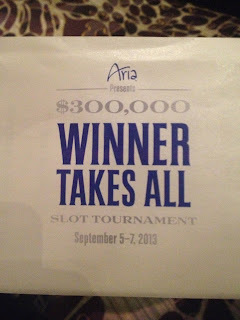 I'm sure Aria will likely have a tournament in the spring. I know they have another one in October, but I'm not doing it. You will love the miso glazed chilean sea bass if you enjoy seafood, I promise! Always love your trip reports, Diana! Good luck on your next trip! I read your blog all the time and love it. 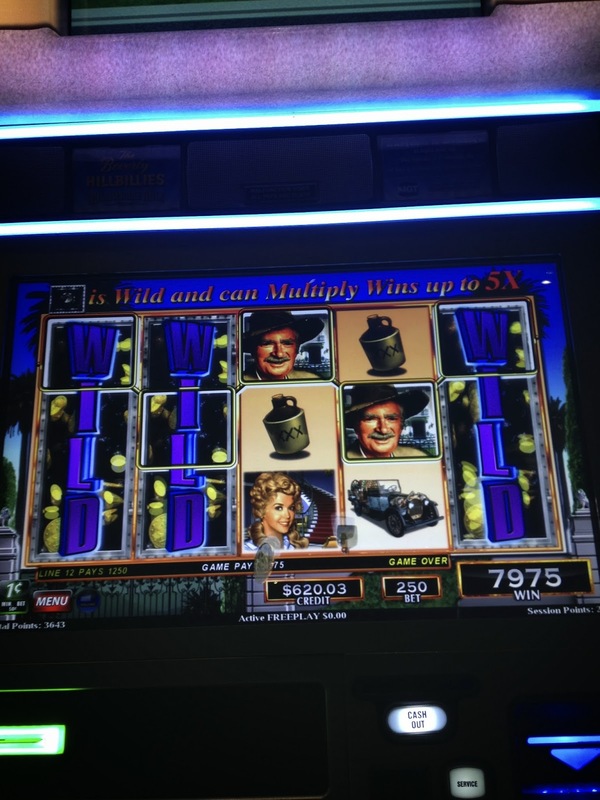 We are currently Platinum with MLife, soon to evaporate back to Gold, but we live in MI so we don't have a chance to get to Vegas often and Detroit doesn't offer the same tier credit system. Neither here nor there, what I really want to ask is how to know if something is a "speciality slot" like you talked about. 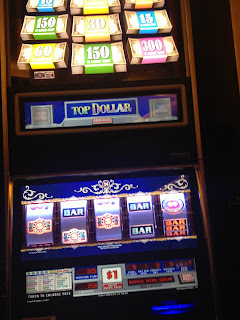 I'm sure the answer is obvious and I feel silly even asking but I need to know for our December trip to Bellagio! 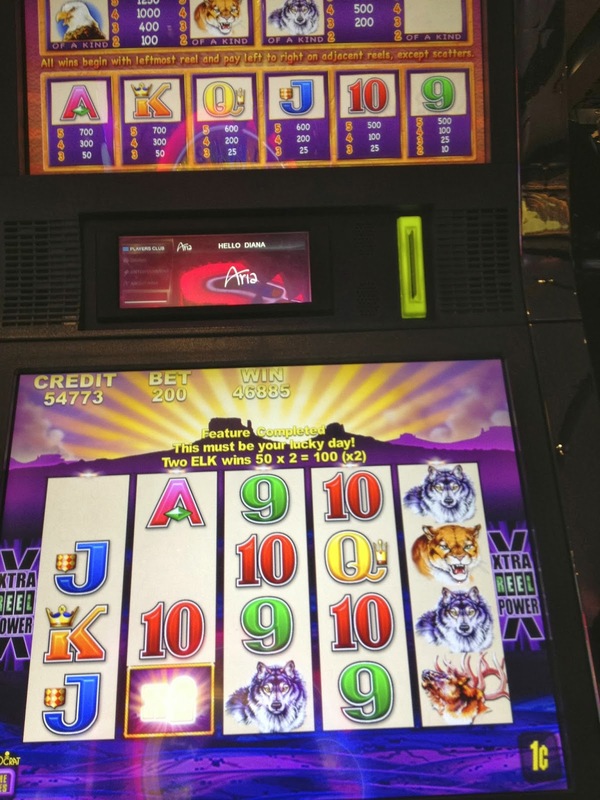 When in doubt if a M-Life slot is a specialty slot try to track your points as you earn them and if you find you aren't hardly any points, it's a speciality slot. By the way Speciality slots don't effect your tier points, just the points you earn for express comps, holiday points and point play. 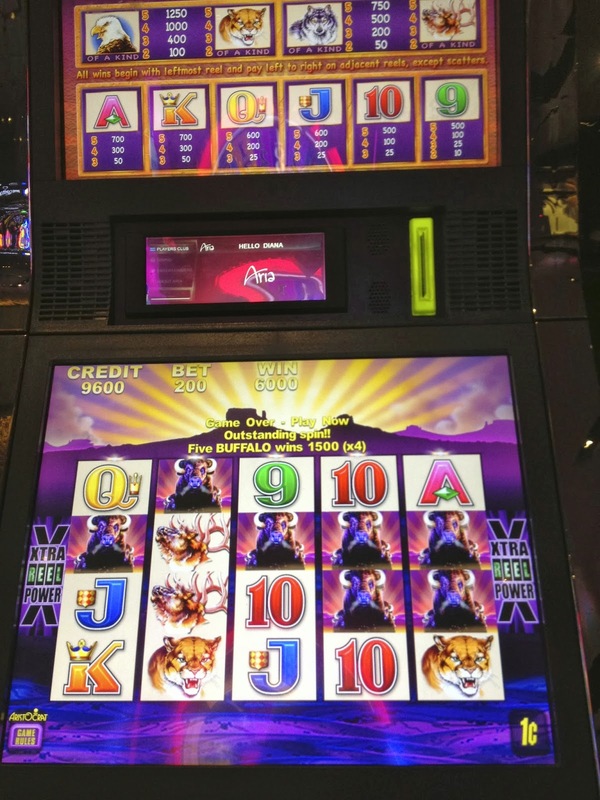 Have a stay at Bellagio and good luck on your December trip. Are you going to be there around Christmas? That makes sense, thanks! We won't be there for Christmas, but will be there for the Holiday Gift Shoppe, Dec 3-5th! Good luck on your trip, I'm sure you will have a lot of fun! Glad you liked it Mia, it's one of my favorite views. The Mob Attraction at Tropicana! 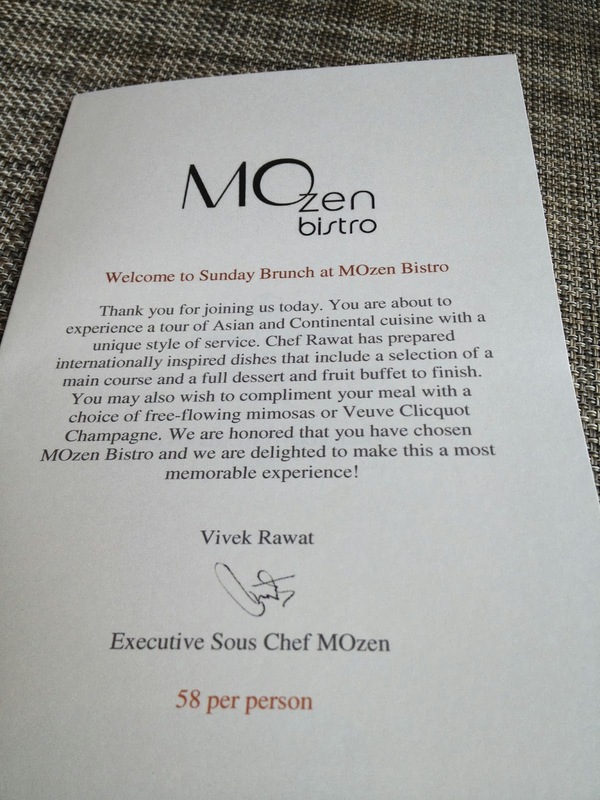 MOzen Bistro Brunch at Mandarin Oriental! 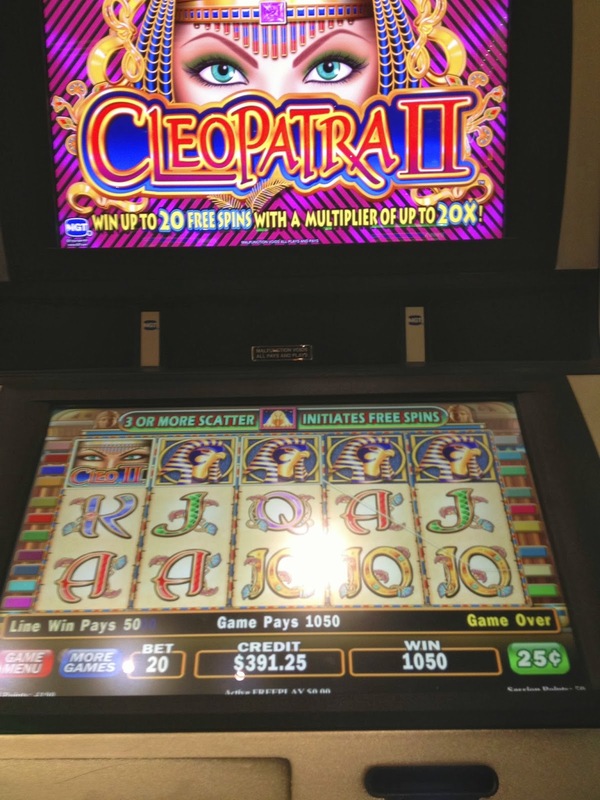 Vegas Birthday's and Grazie Slot Tournament!